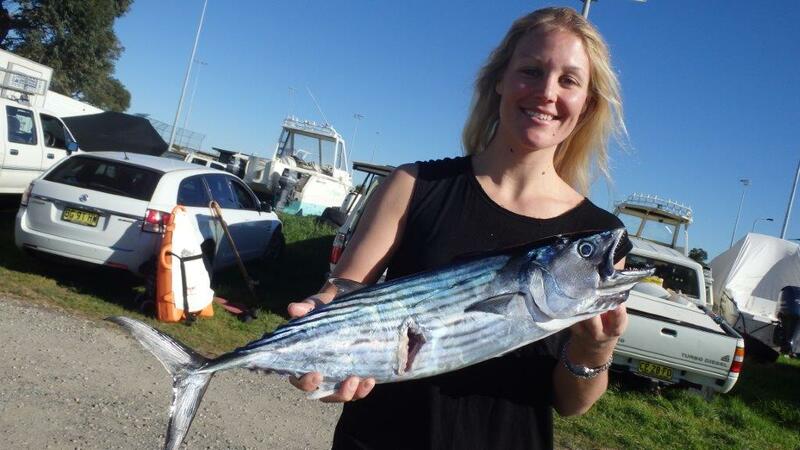 I guess when I first heard about this massive, huge, big money fishing comp I was a bit ““oh yeah” line fishing, so what?! 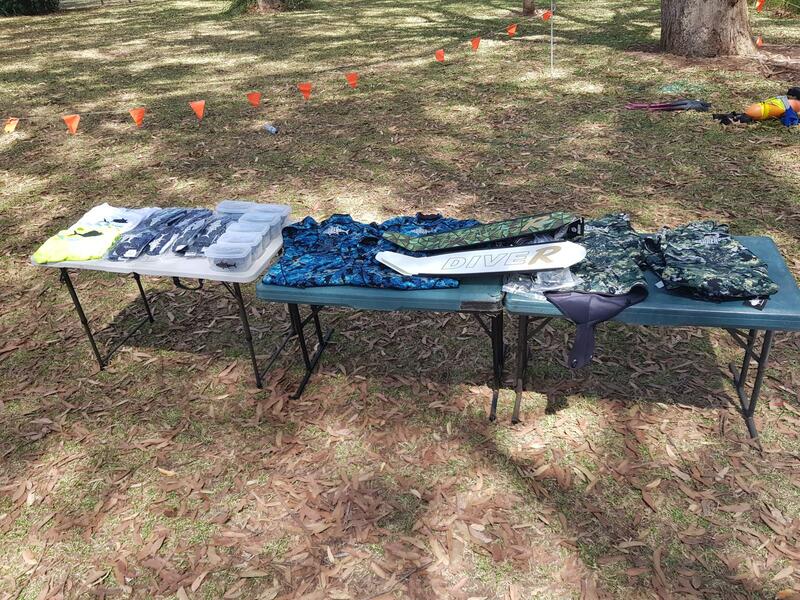 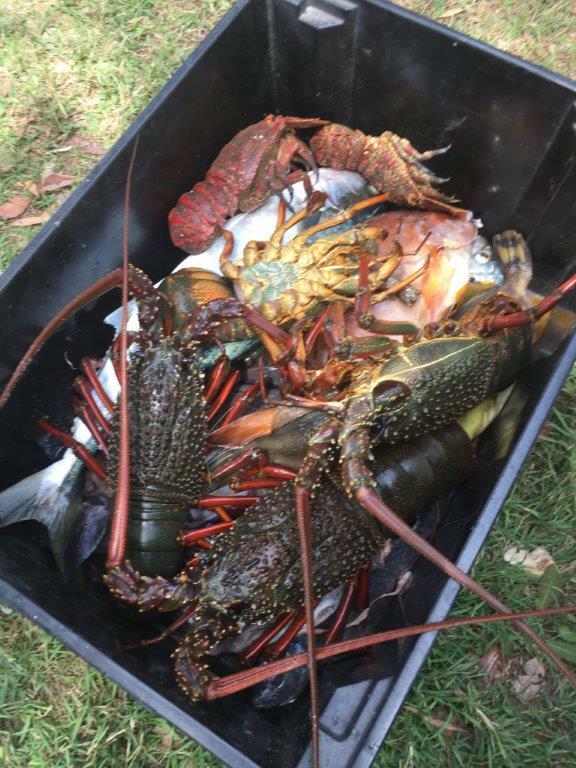 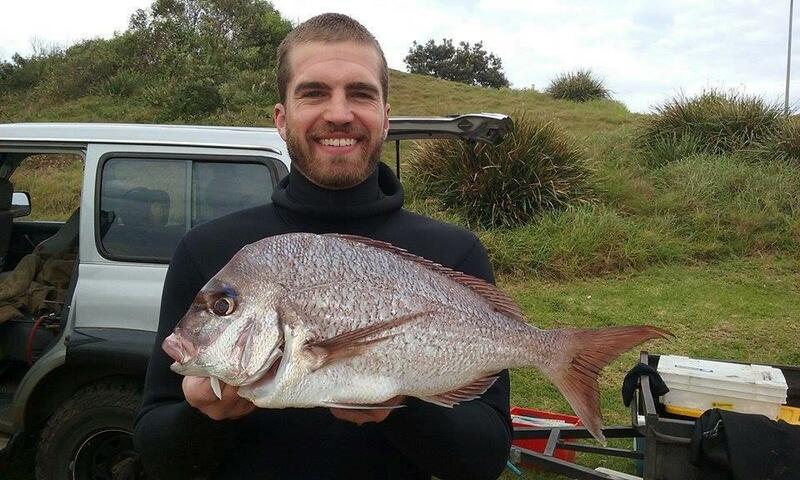 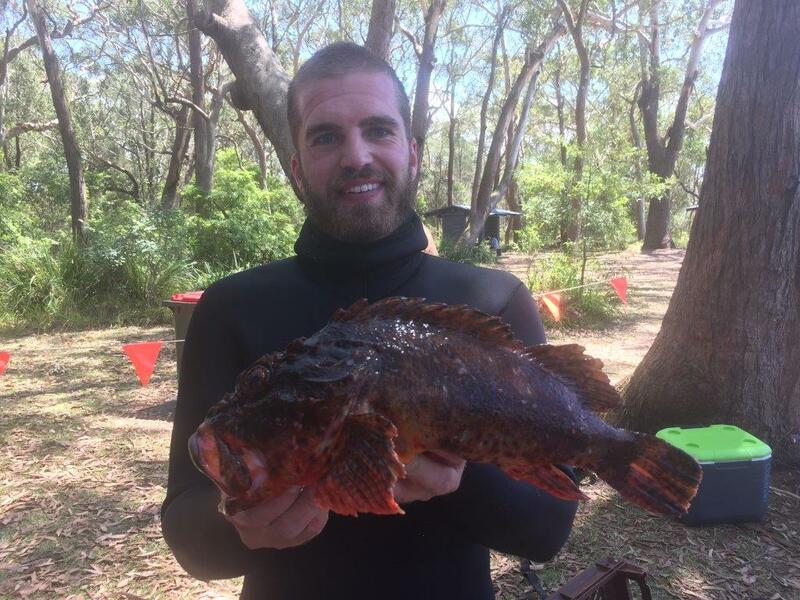 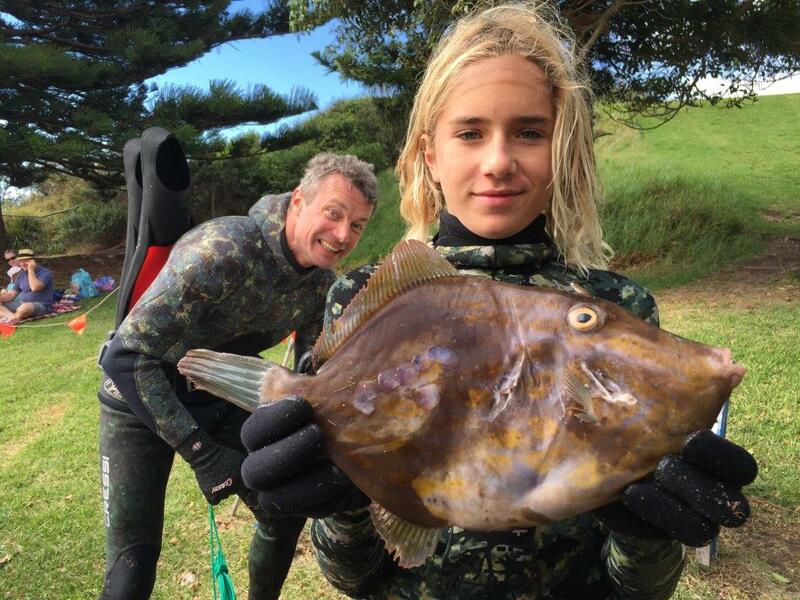 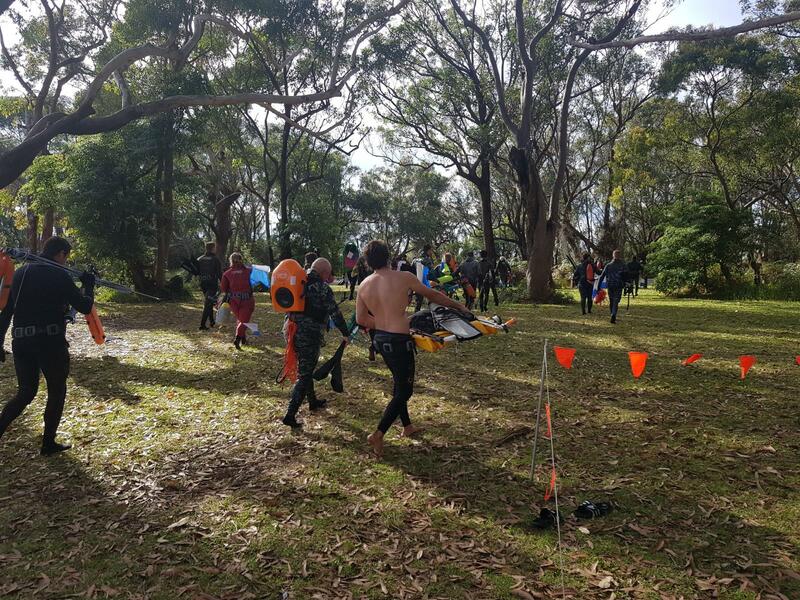 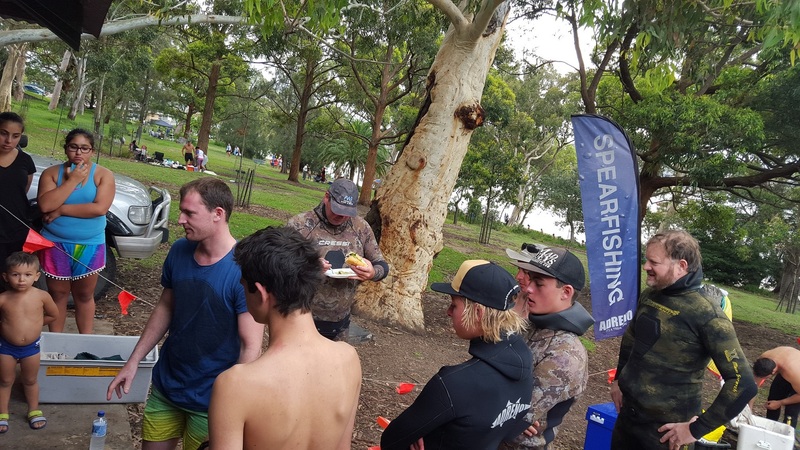 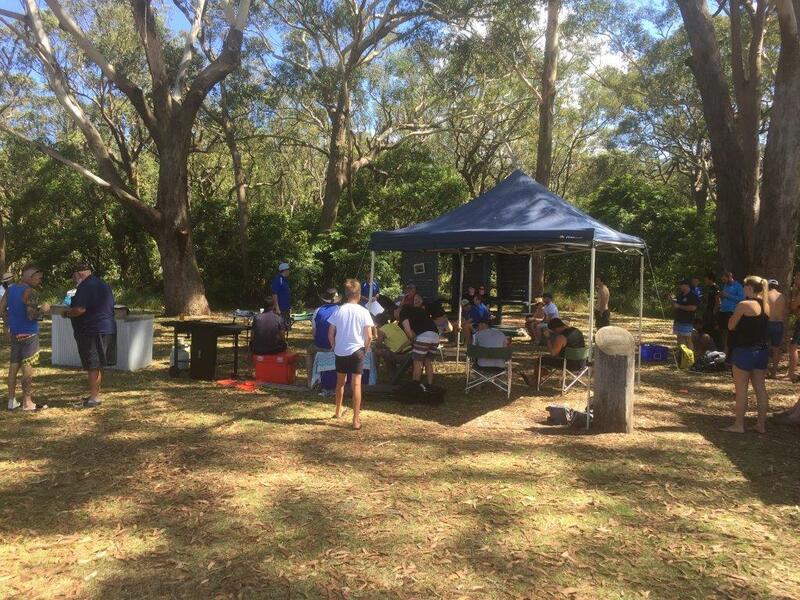 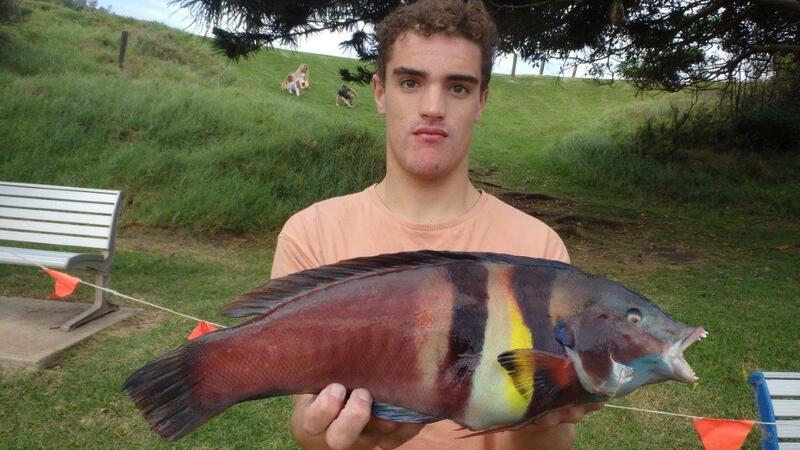 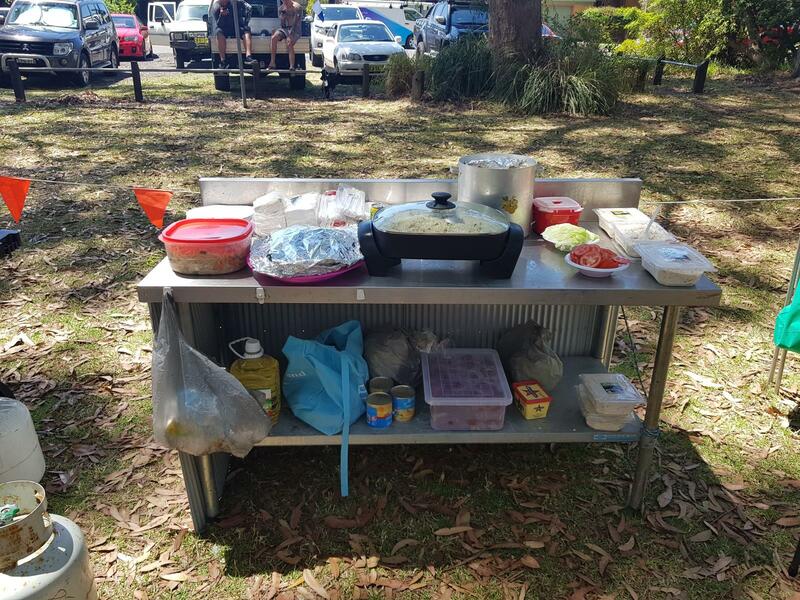 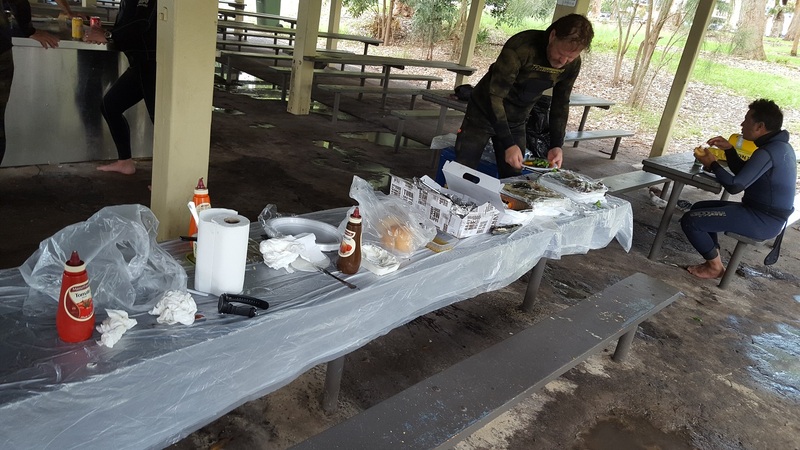 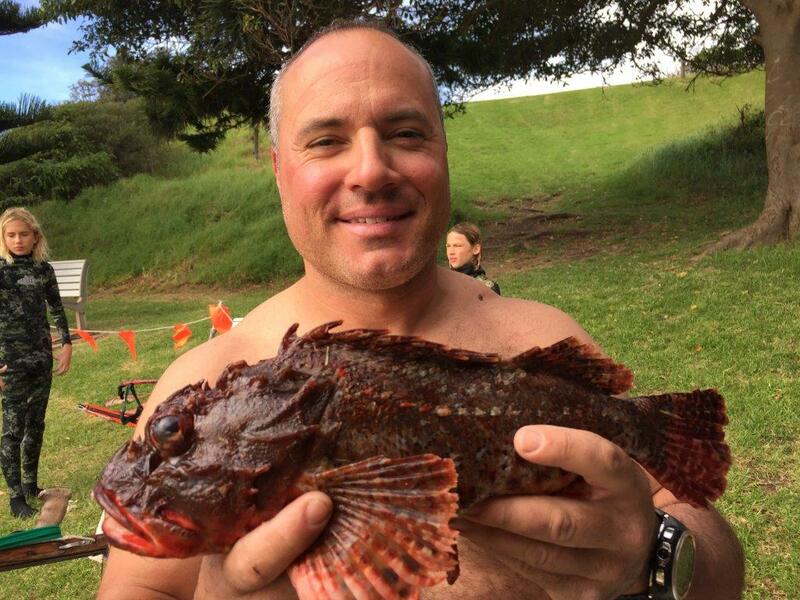 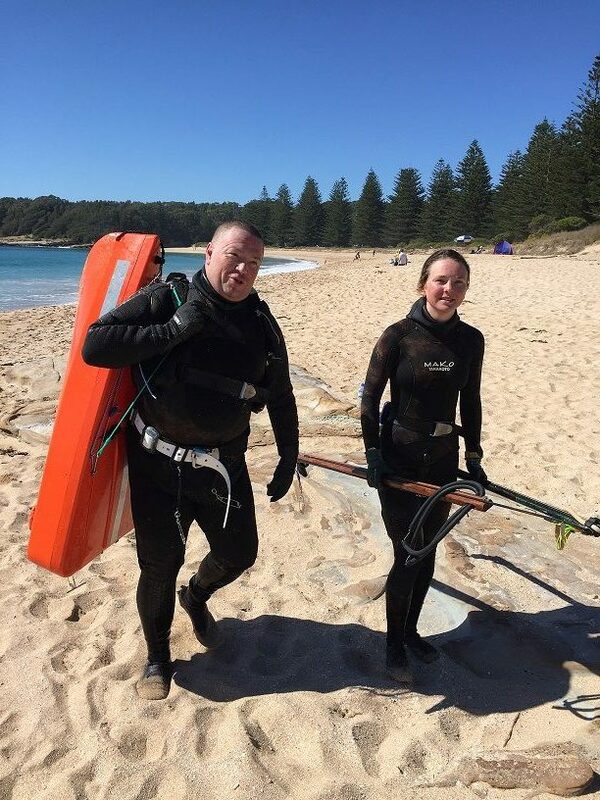 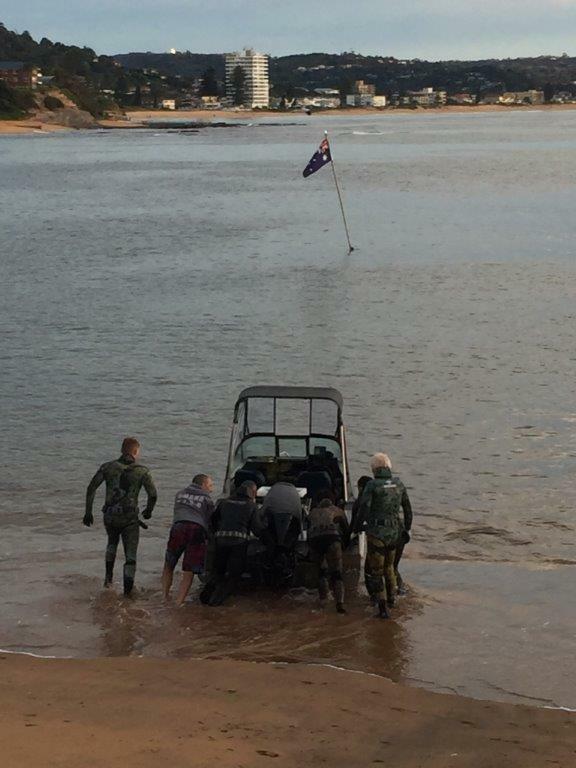 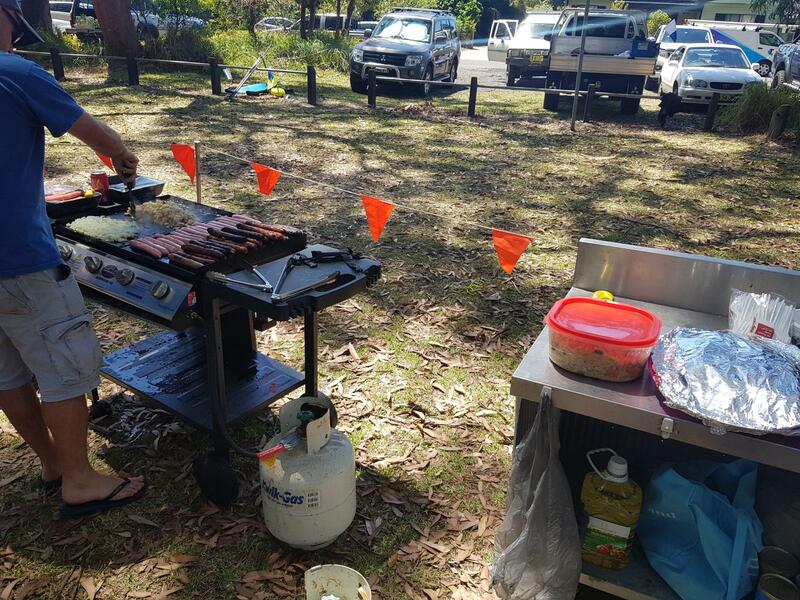 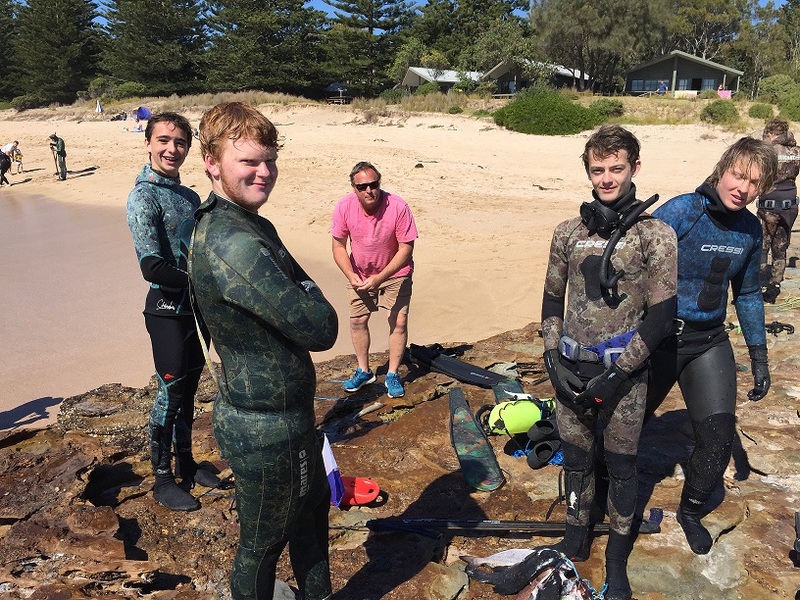 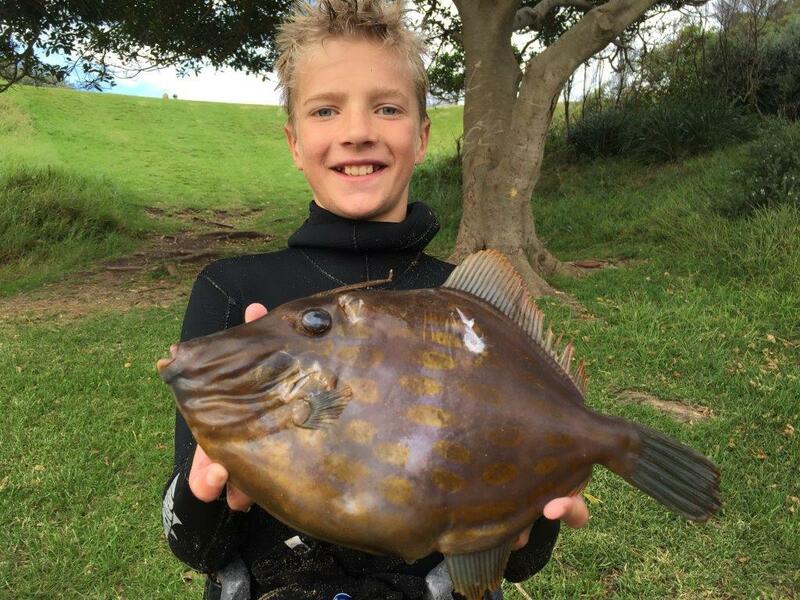 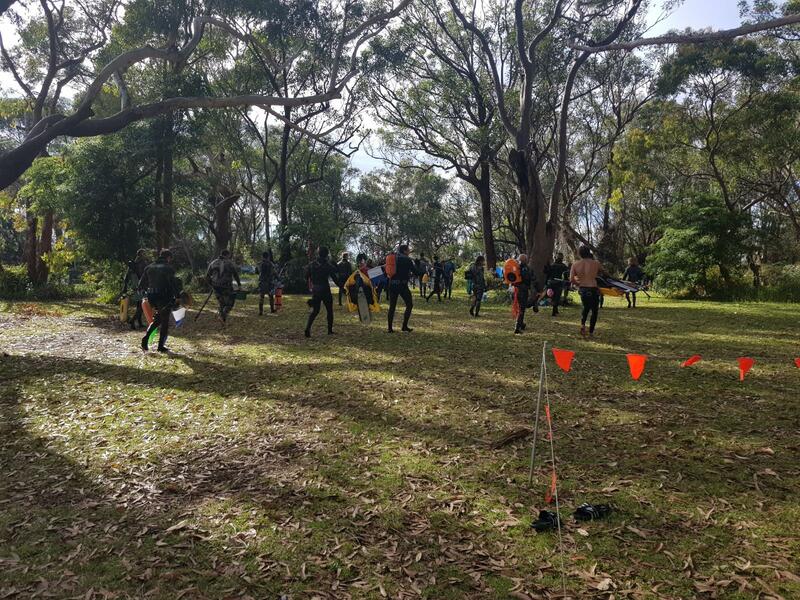 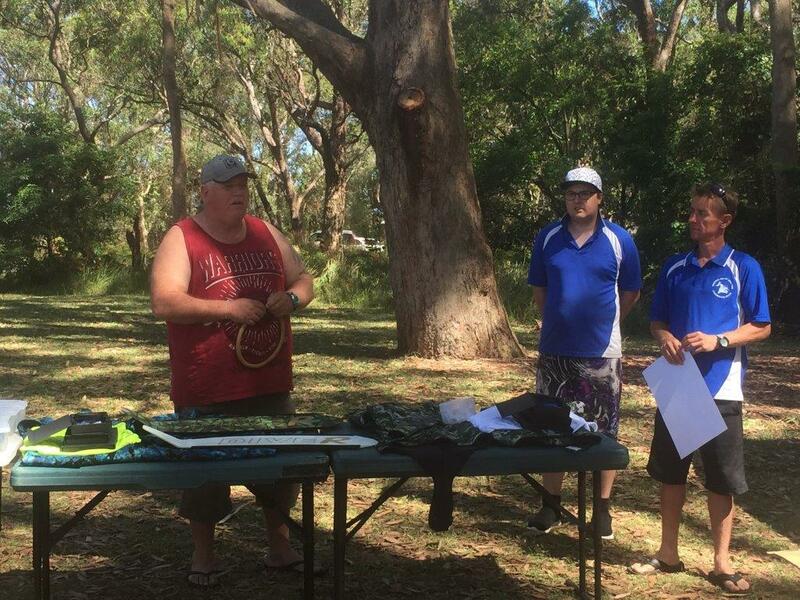 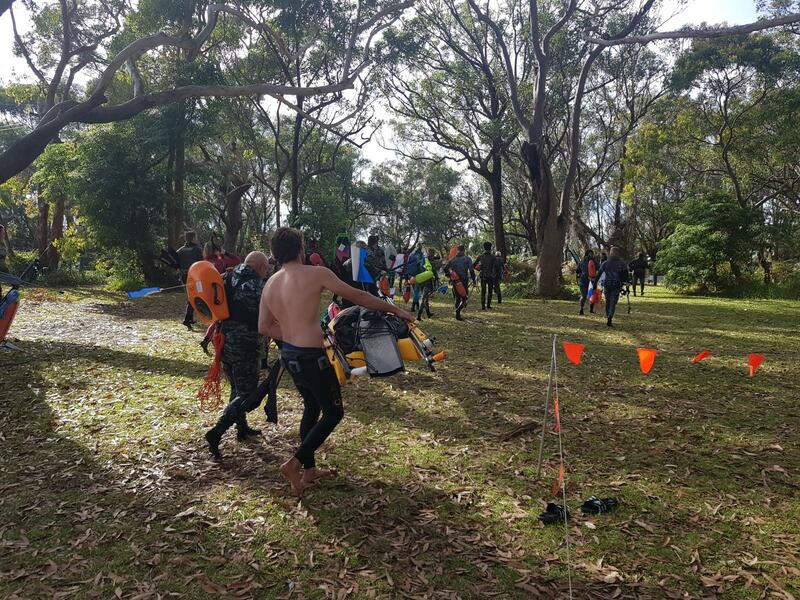 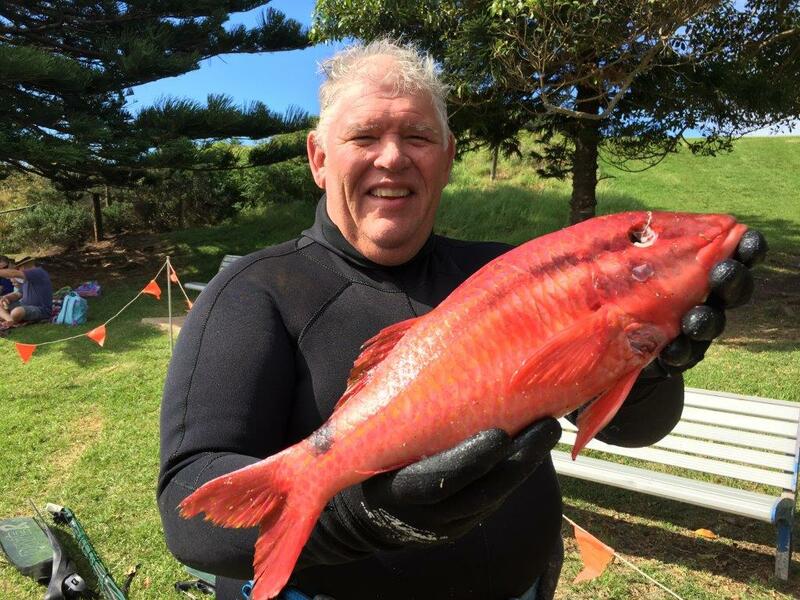 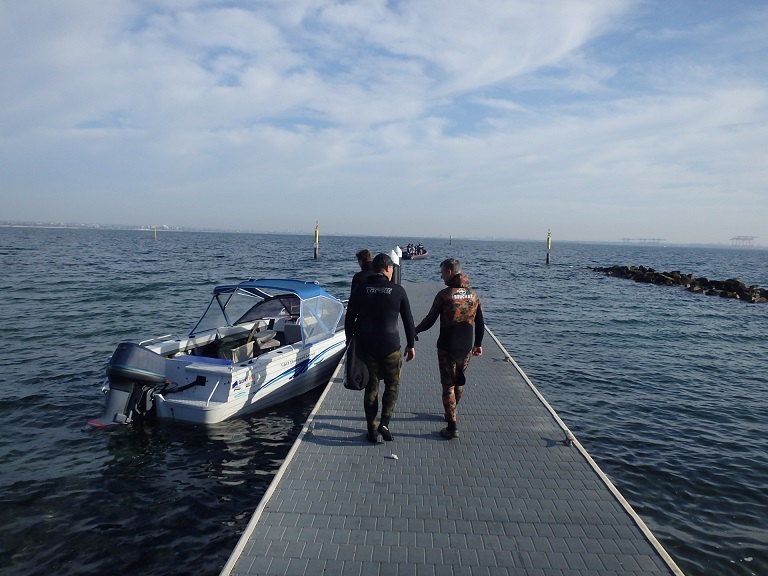 ?” I was surprised that there was going to be a spearfishing event, I pricked my ears and I liked the phrases I was hearing “great for the community…educate the growing spearfishing community on safety…getting all kinds of rec fishers together…family weekend away during school holidays…. 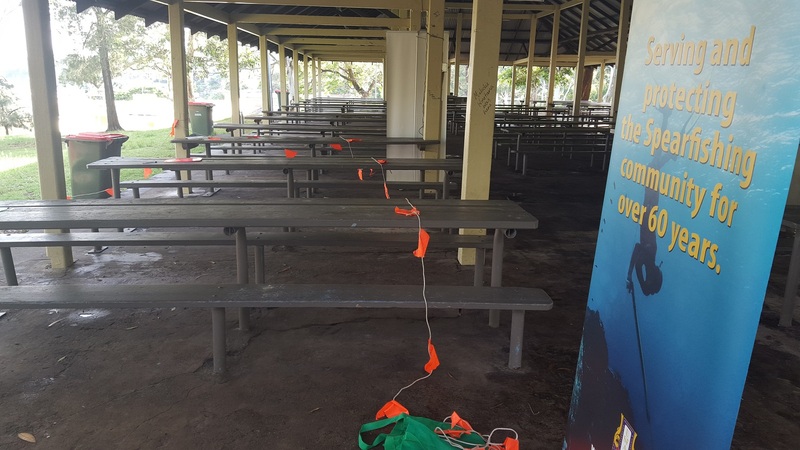 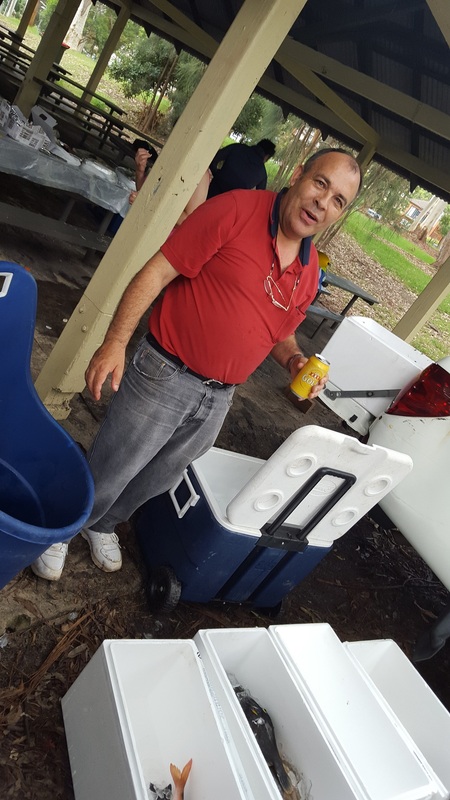 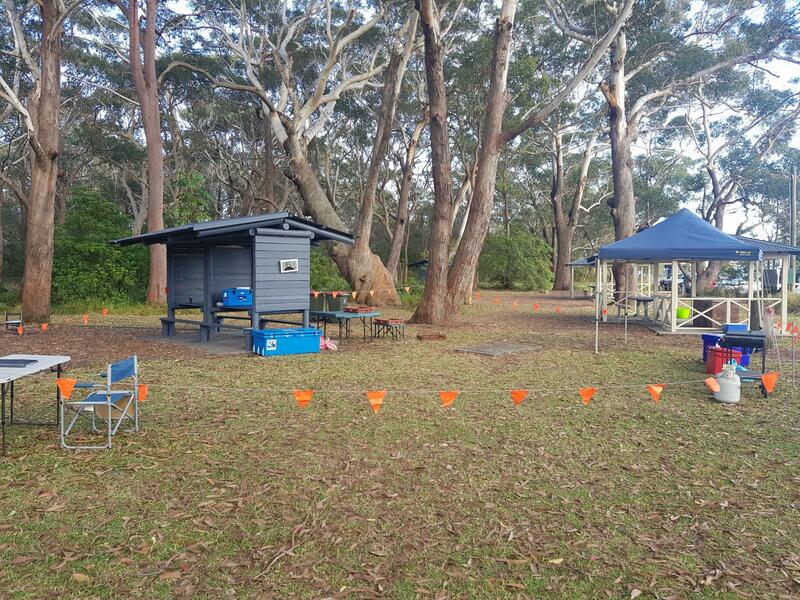 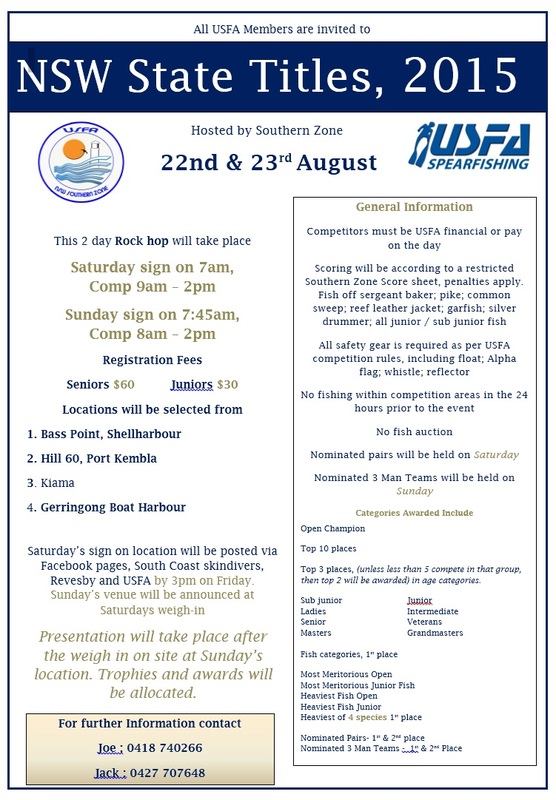 the council is right behind this…Fisheries love it….” then Adam Martin who seems to run the beautiful township of Tomakin on one hours sleep a week, contacts the USFA and asks if they would be interested in “running” the spearing side of the event on the Tomakin Fishing Clubs behalf. 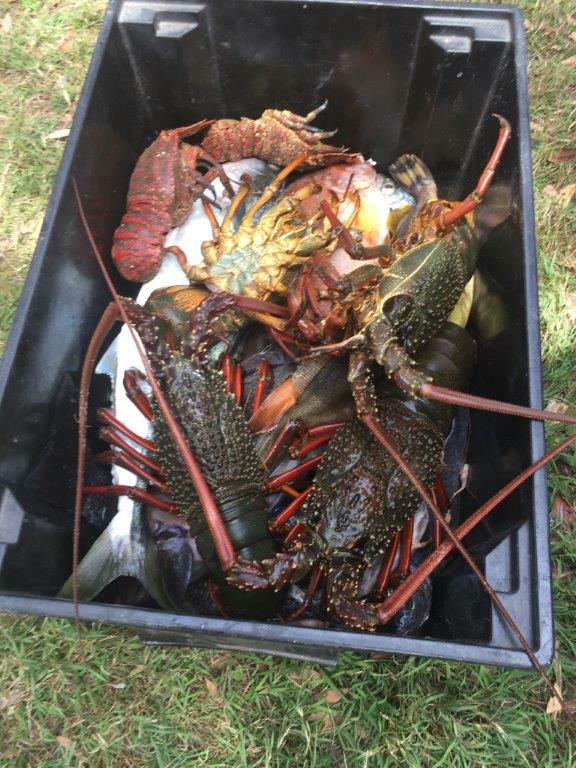 How could you say no! 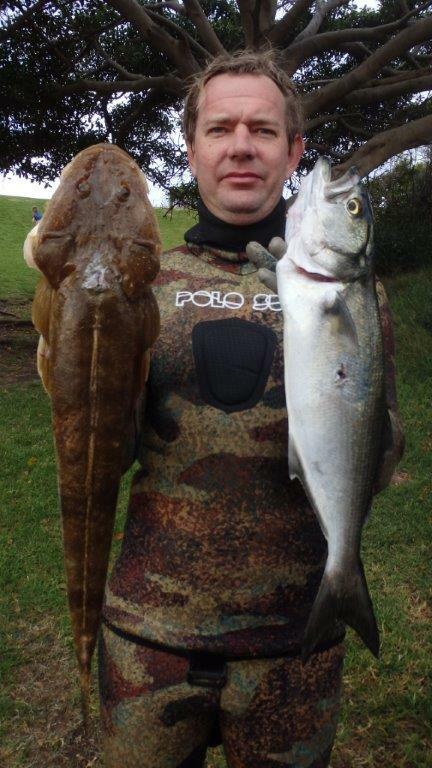 After a couple of months of brain storming back and forth between many spearos and fishos it was decided to run a true pairs event, that is, two divers spearfishing together that sees one spearfisher diving while his pair dive buddy remains on the surface, this is really putting into practice what the now well coined term “One Up One Down” is all about, it’s great spearfishing safety. 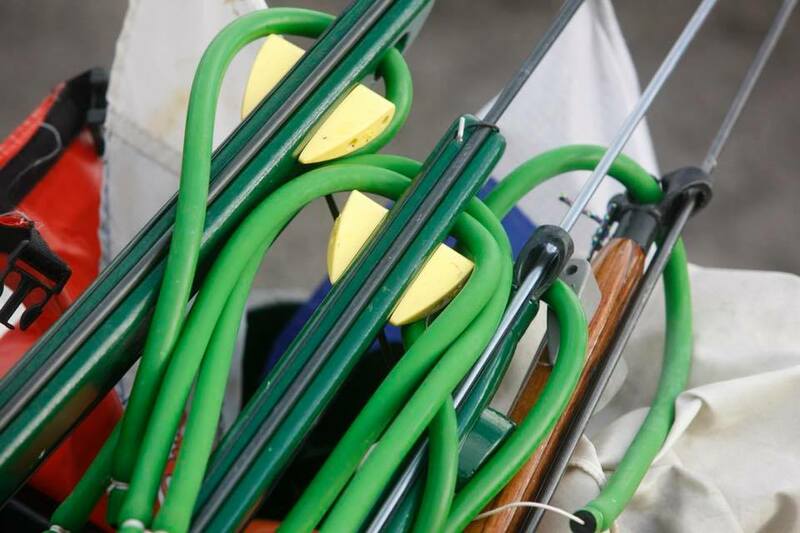 TO explain a little further each pair partner can use one gun and has one rig cord connected to their gun, one of these cords is only 4m long, generally the partner on the surface has the short cord hence the diving partner in the pair has the longer rig cord, both cords are connected to one float only, thus ensuring the float is generally immediately in their dive zone, as east coast southern water spearos can attest to the huge boat traffic we can encounter a dive float and flag is the start of our safe diving checklist. 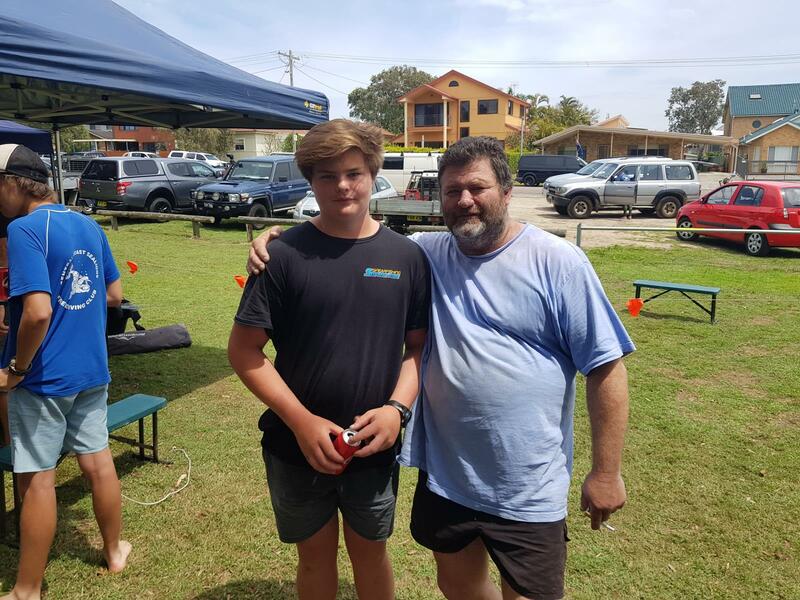 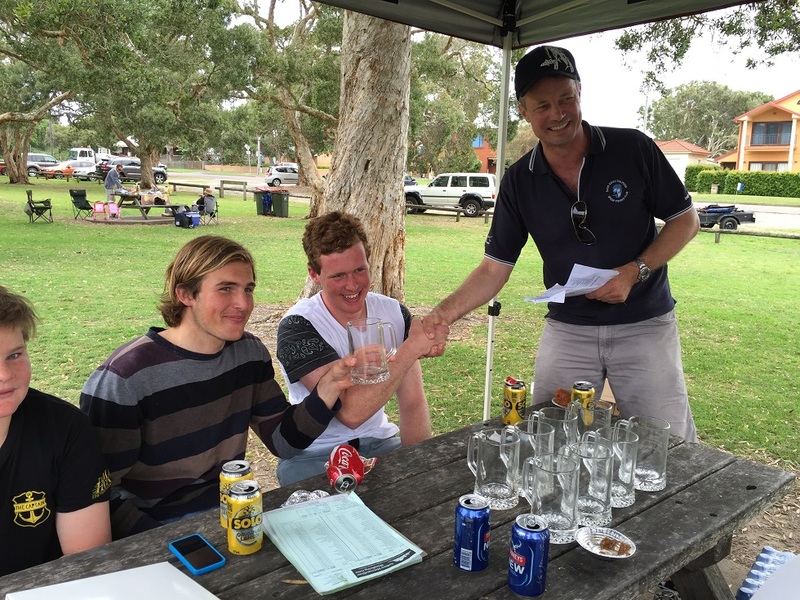 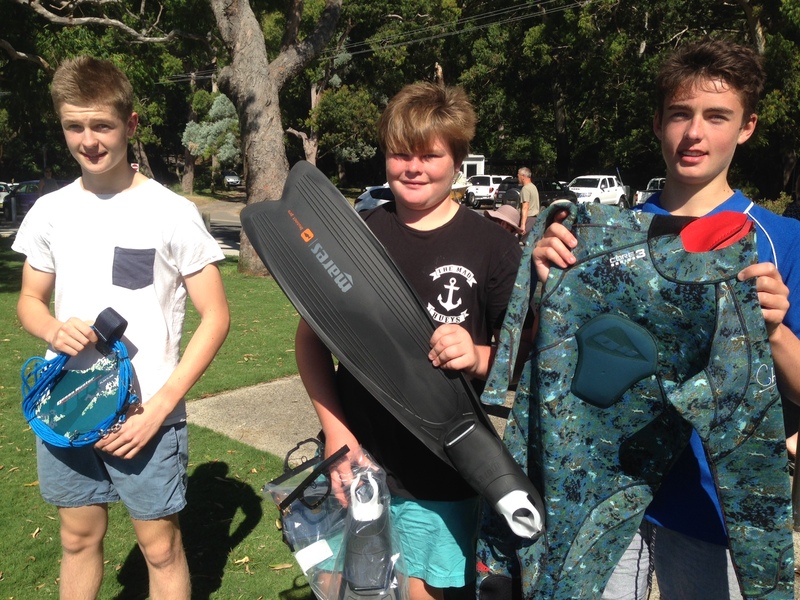 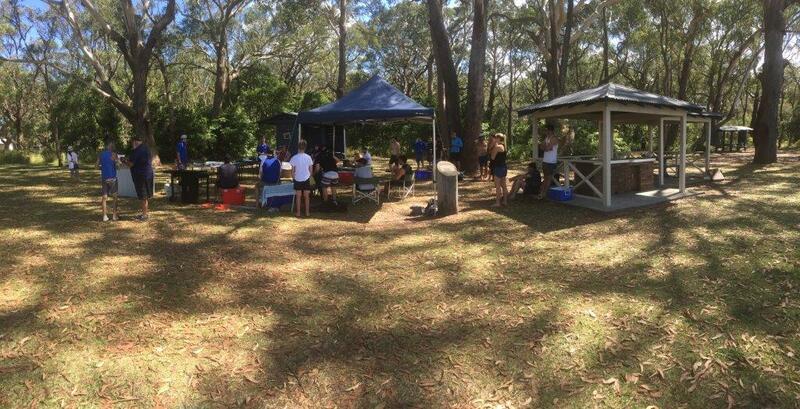 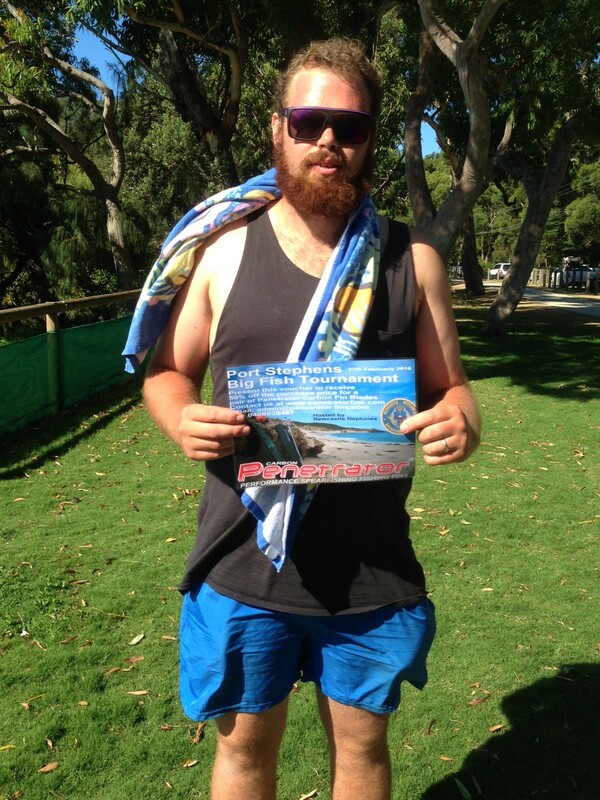 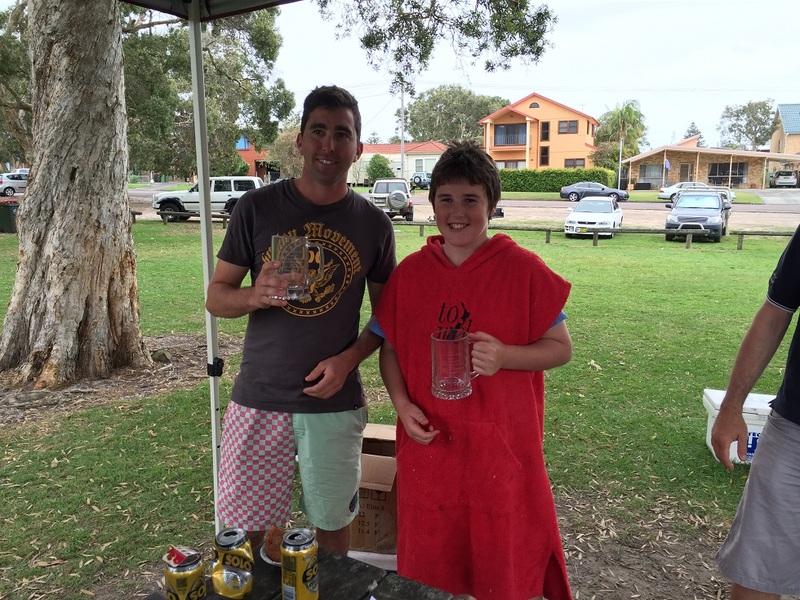 North Shore Underwater Club had a great Junior representation at the Tomakin Bonanza. 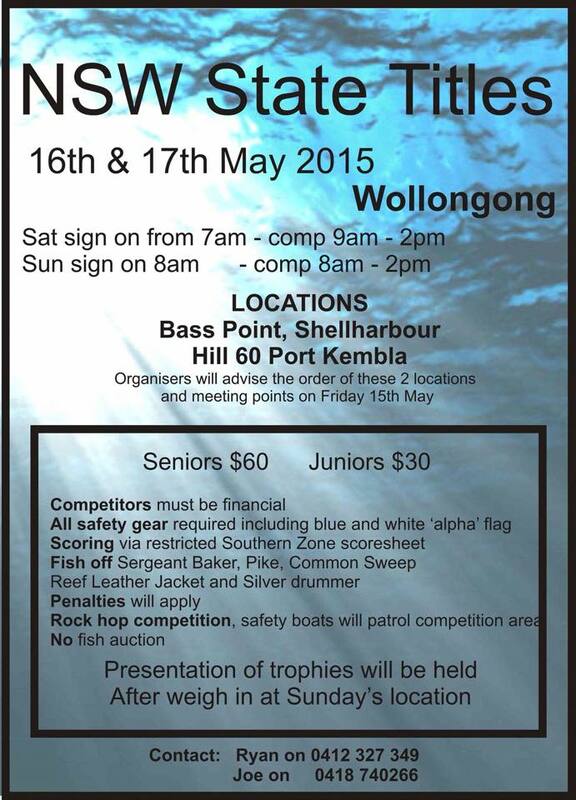 Juniors made up one quarter of the sign on. 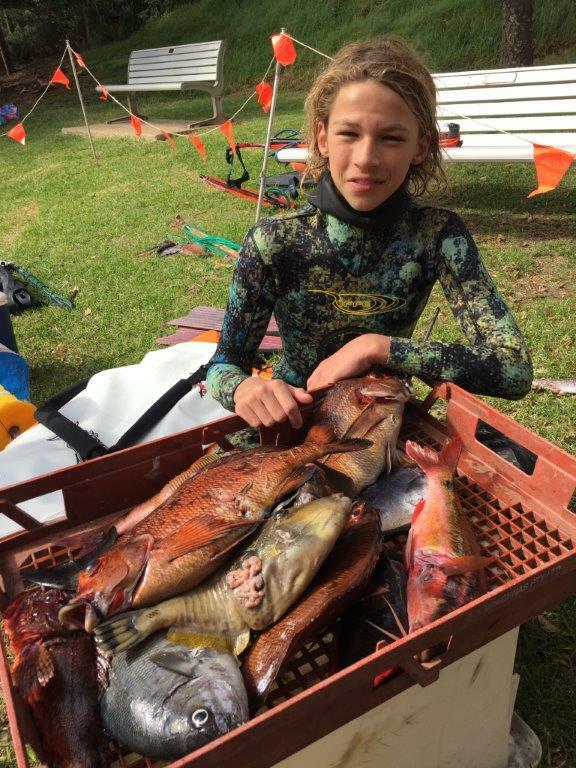 A bright future for spearfishing. 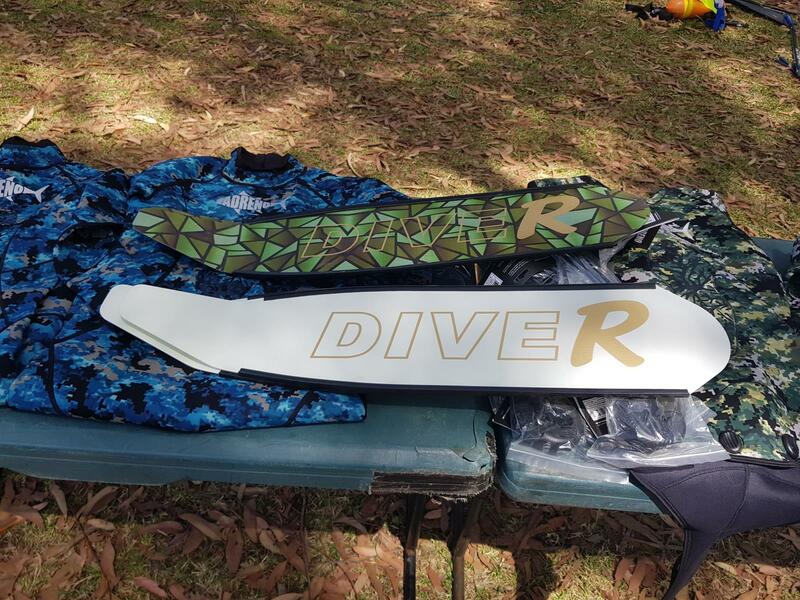 So this is the lucky spearo, Rob Crawford, who won the awesome Ray Powell DiveR fins designed by one of Ray's many hot artists, Naomi Gittoes, that were raffled at the Sydney Adreno opening day by the USFA. 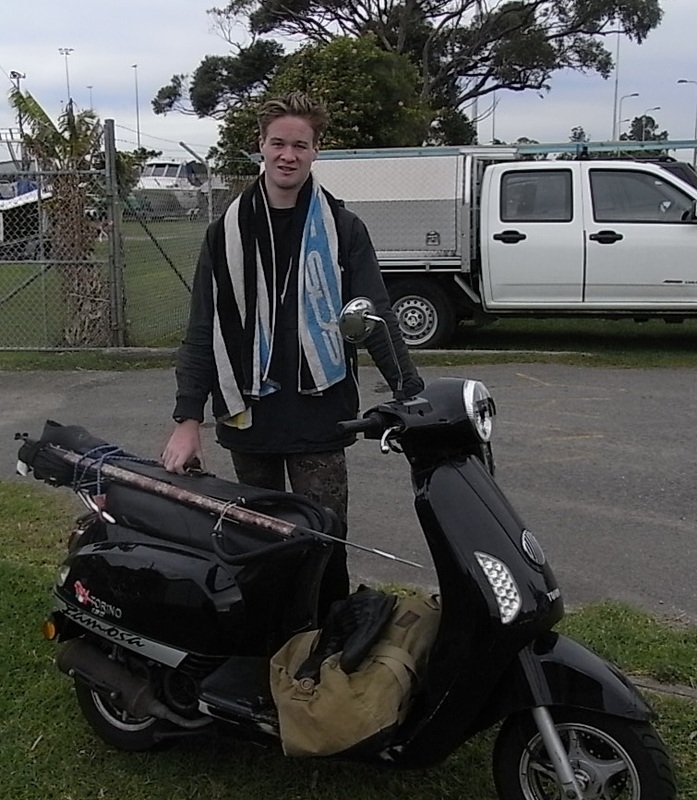 Rob Crawford. 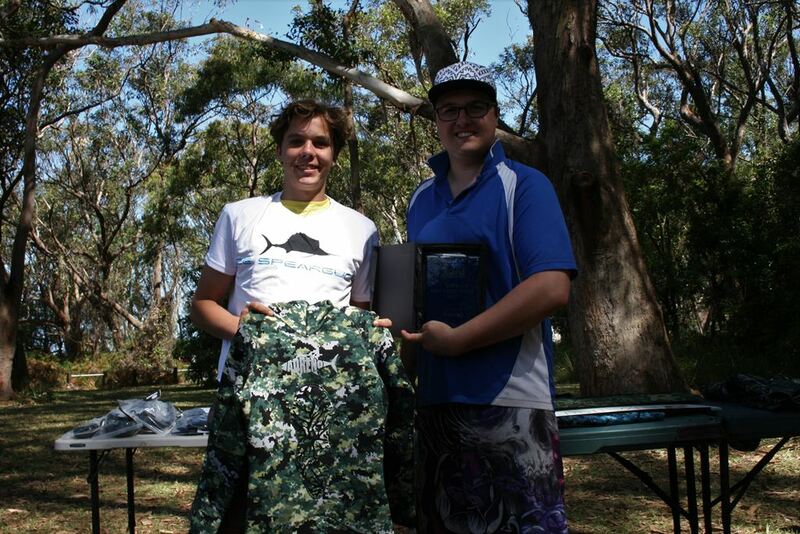 Winner of the USFA prize at the Adreno Sydney opening. 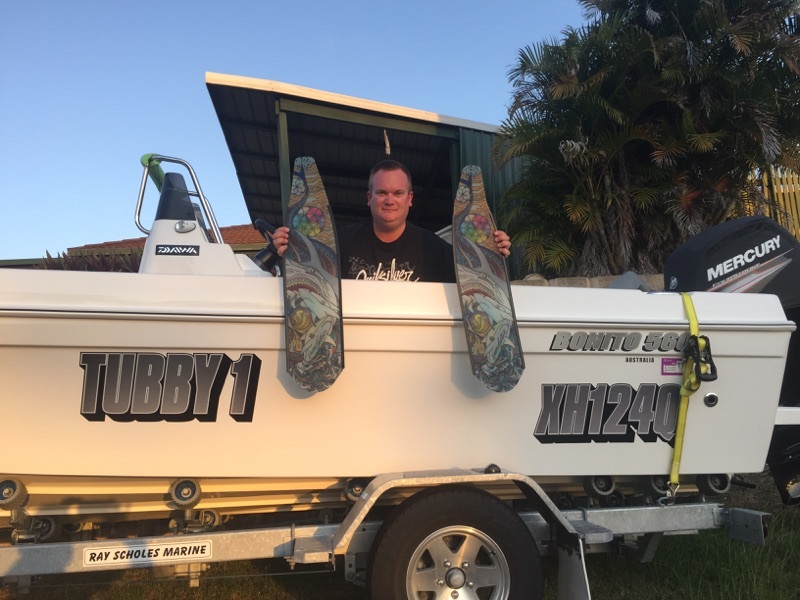 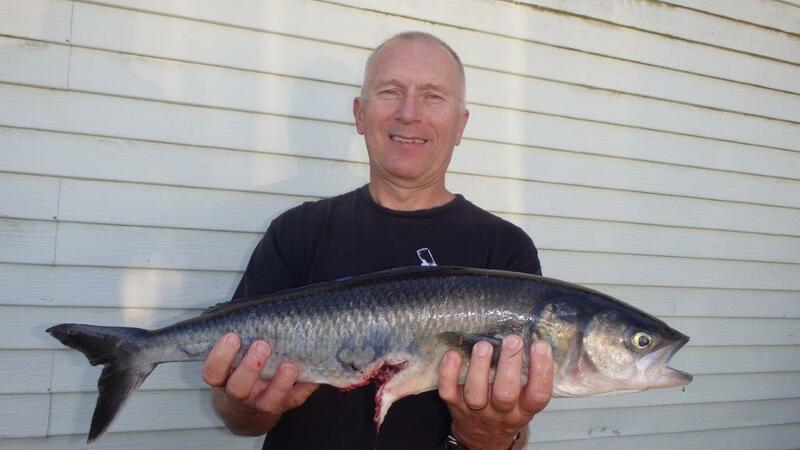 Rob enjoys his spearing and loves a day out on the water in his boat. 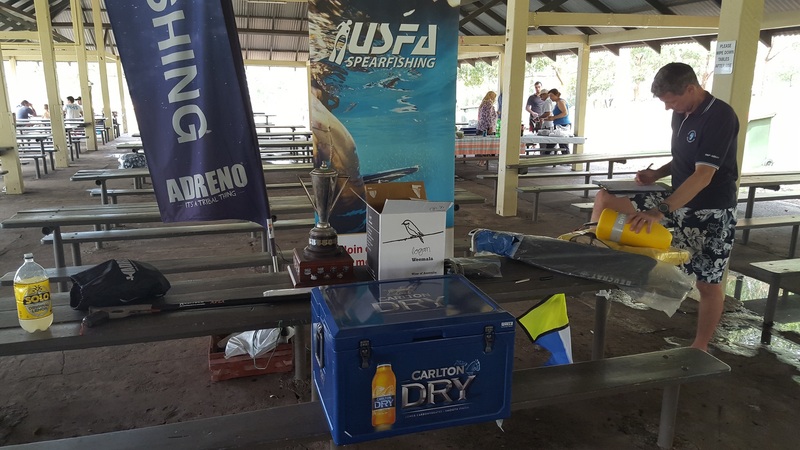 Thanks goes to DiveR Australia for his continued loyalty to the USFA, Adreno for their wonderful support, and to all spearos on the day who purchased a ticket. 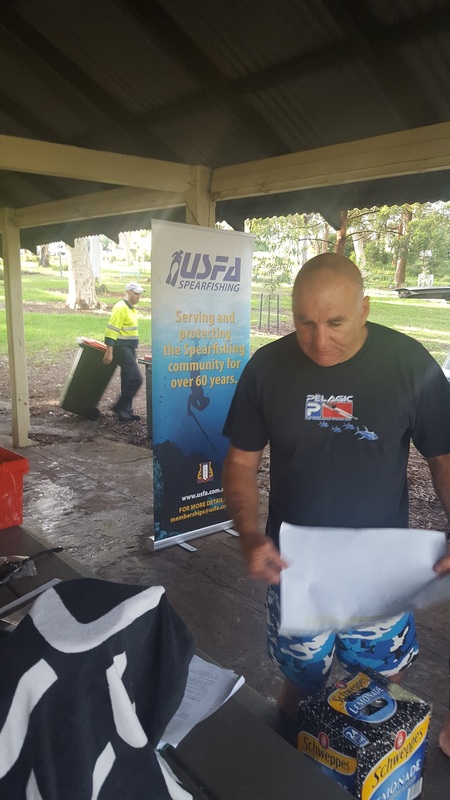 Please look at www.usfa.org for dive and safety tips and to see the work USFA is doing for spearos along the coast. 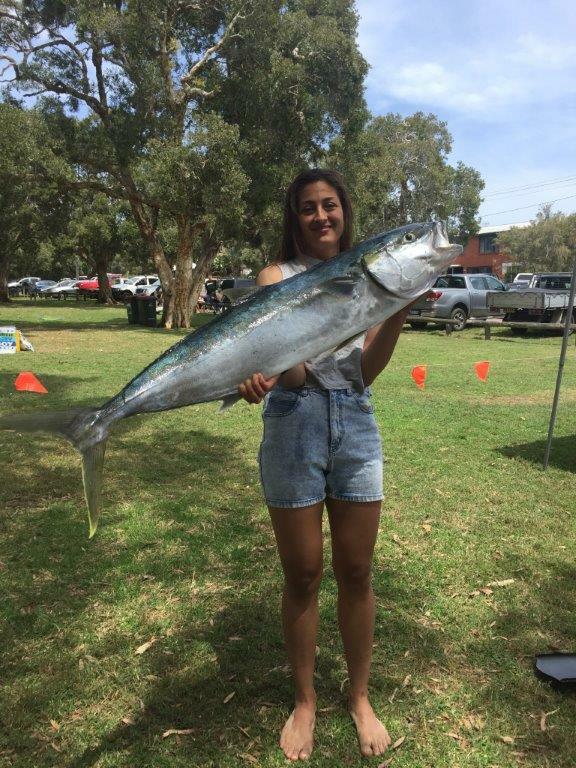 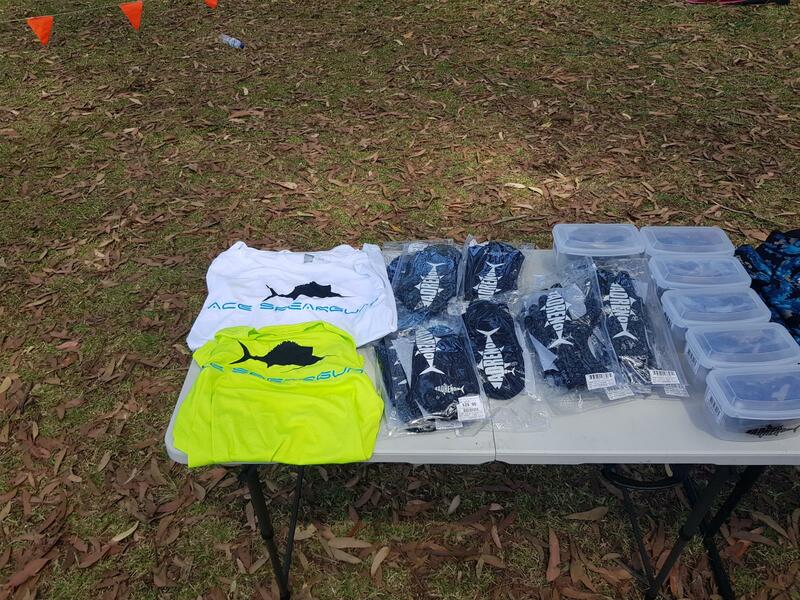 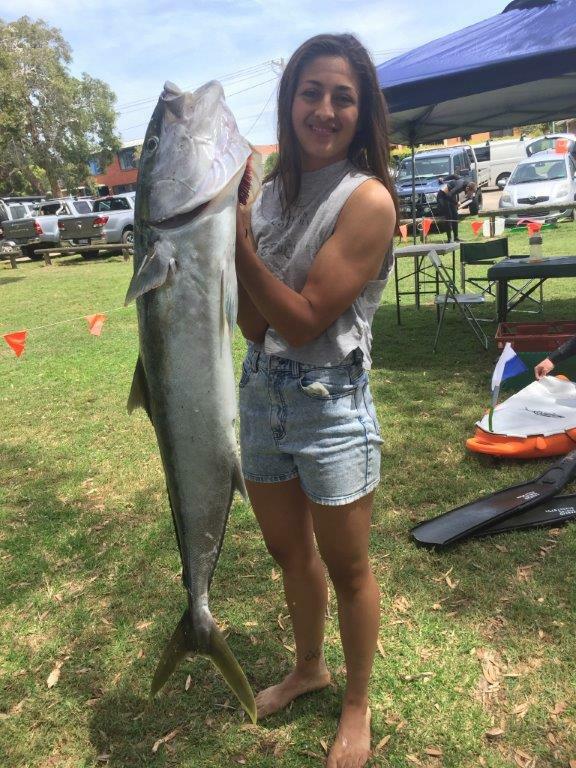 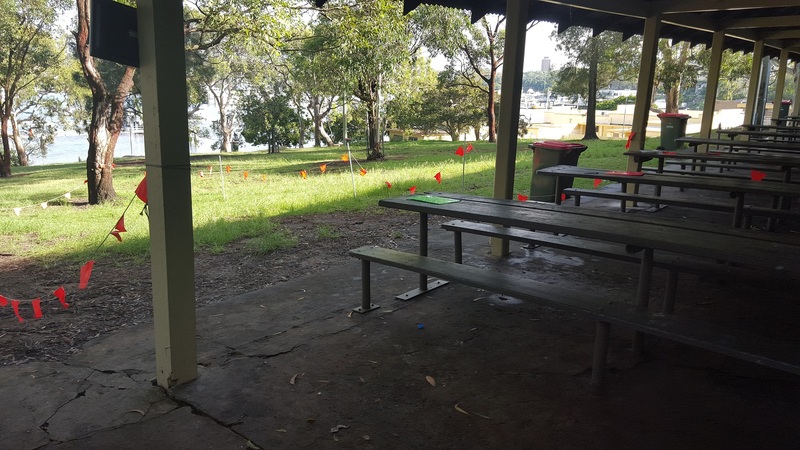 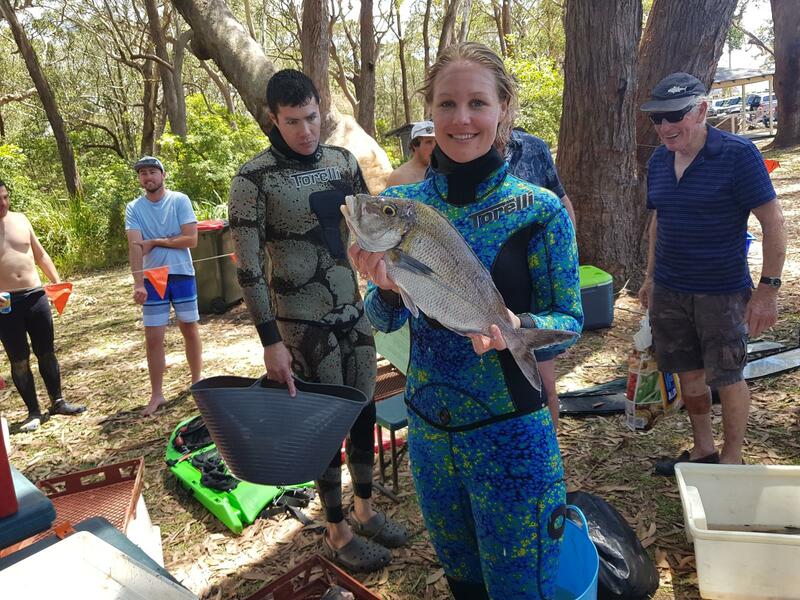 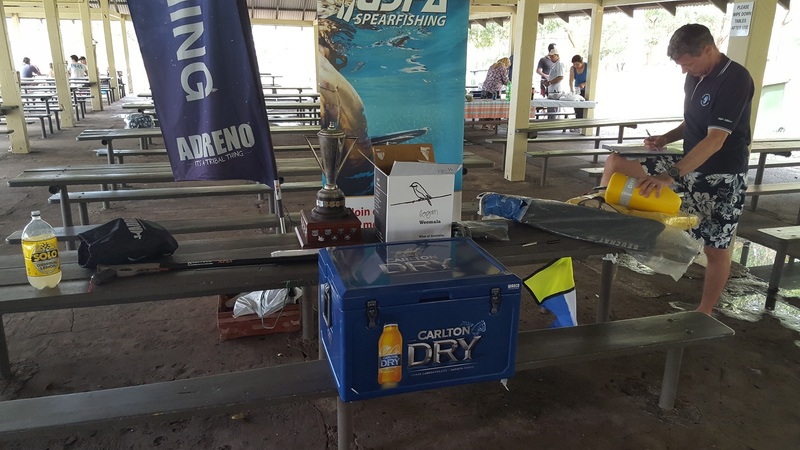 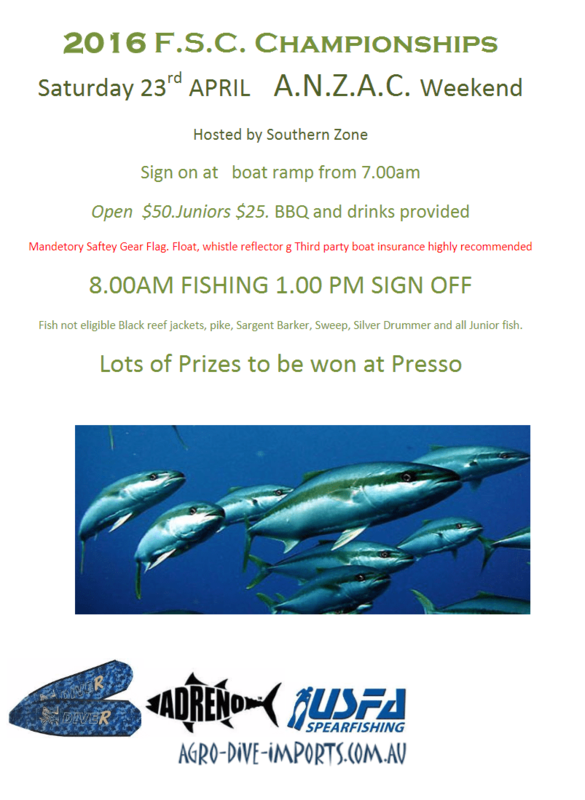 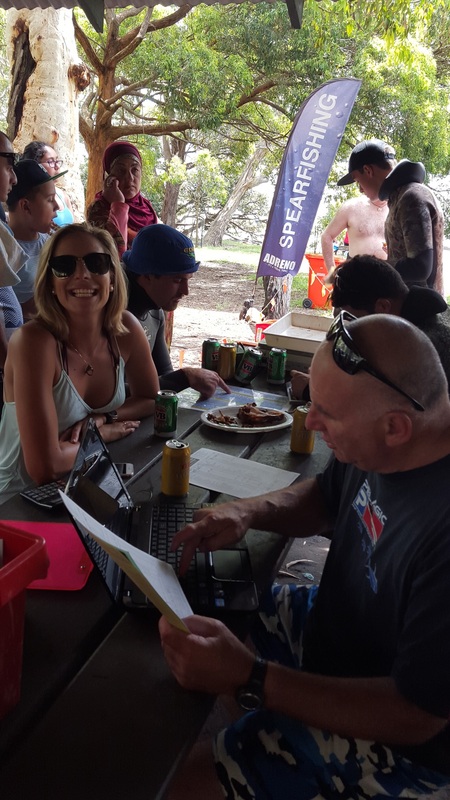 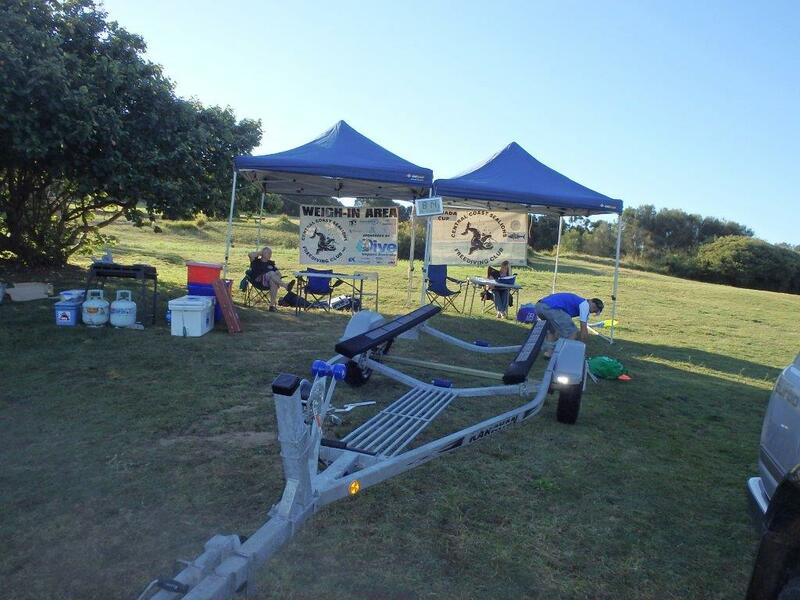 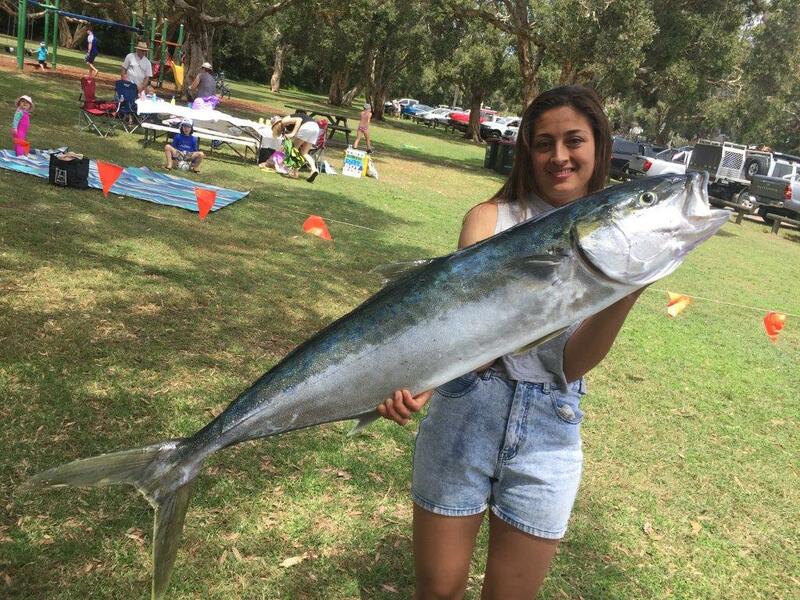 The Sydney Metro Alliman Shield competition is a fin fish spearfishing competition open to both males and females and is held on a monthly basis with scores accumulating across the calendar year. 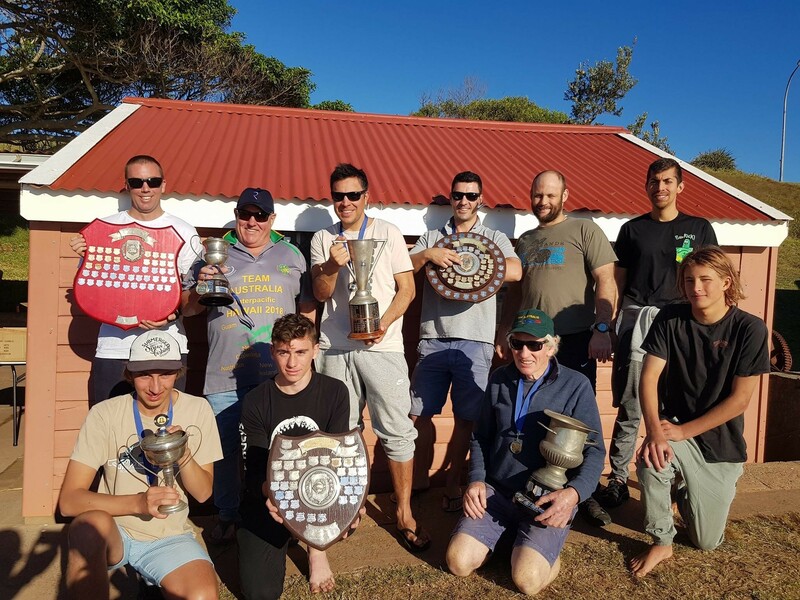 Four Sydney clubs compete in the Alliman Shield with some great competitive rivalry between both mates and clubs. 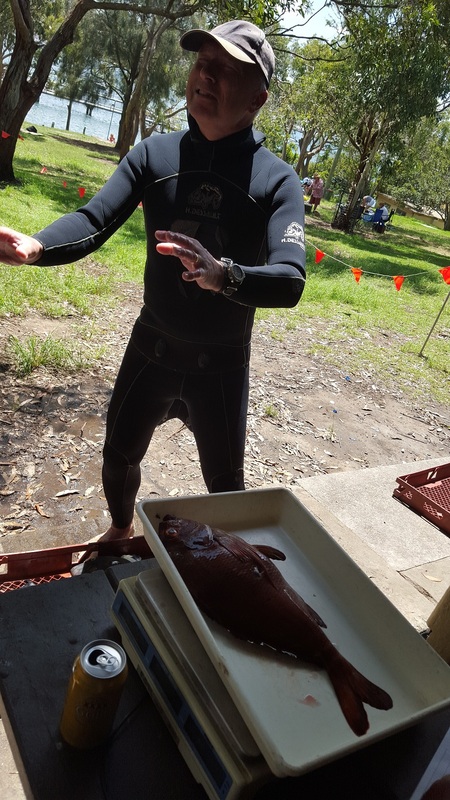 The Alliman Shield Competition days are a great opportunity for divers to learn how to hunt a large diversity of fish species and forces divers to think about the fish they want to take, where to find them, techniques and the best equipment to use. 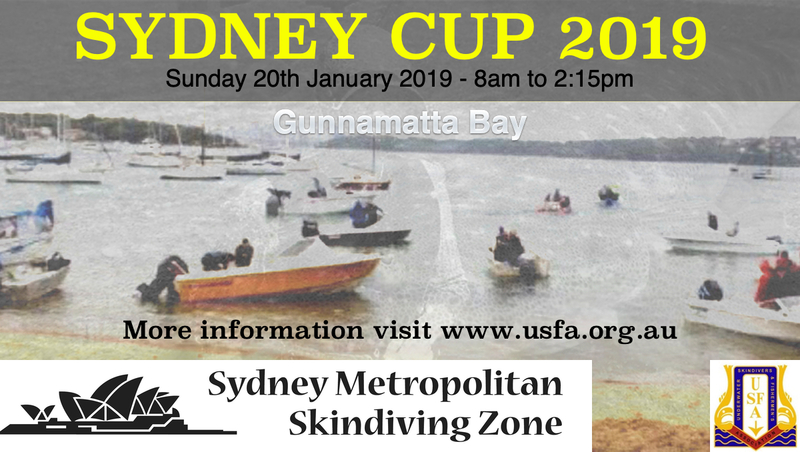 It also provides a set date, usually the first Sunday of each month, when divers can plan to hit the water together and try their best in the local arena or just have a bit of fun with mates. 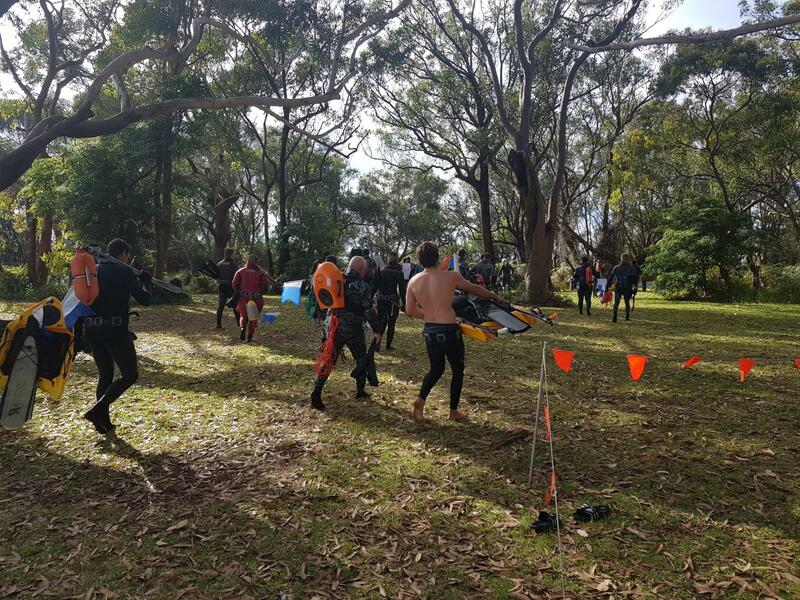 There are many different categories within the Alliman Shield competition based on age and diver ability and divers range from National Champions through to absolute beginners. 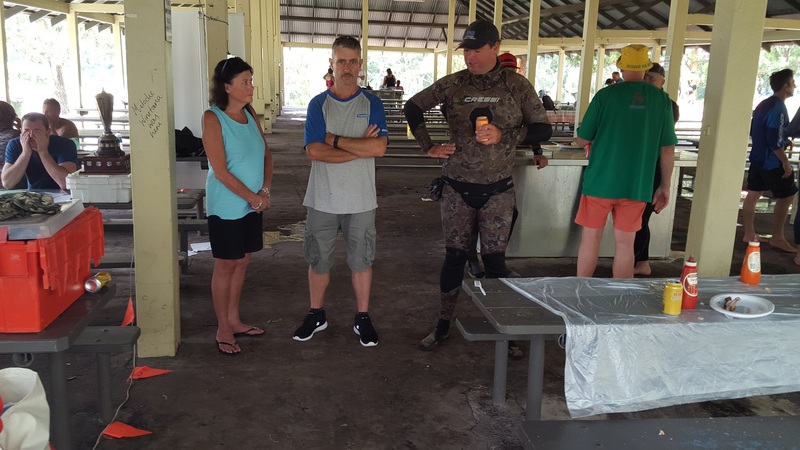 There is no better way to learn about spearfishing than to dive the comps and learn from the experience of the great divers around you. 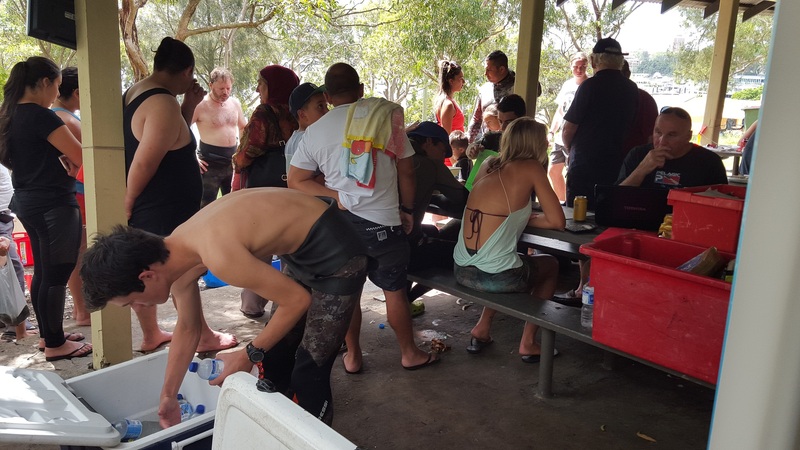 The weigh-ins at the end of the day are always good social events with divers swapping stories of the adventures of the day, proudly showing off their fish or just enjoying a drink or two with mates and fellow divers. 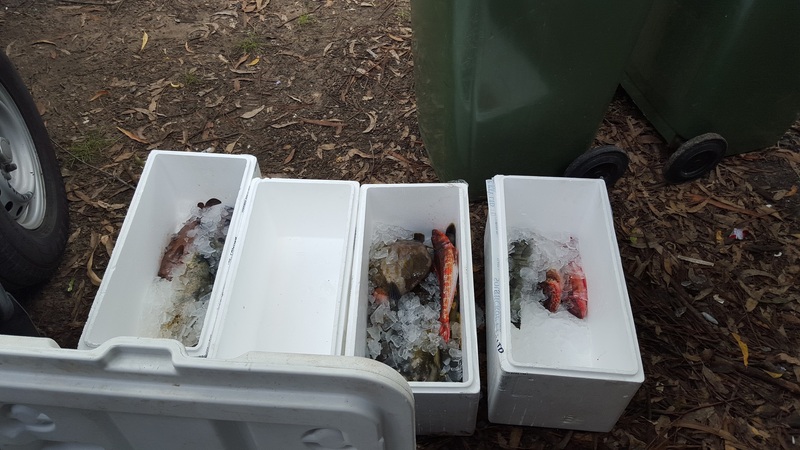 And of course, you end of with some fresh fish for dinner at the end of the day! 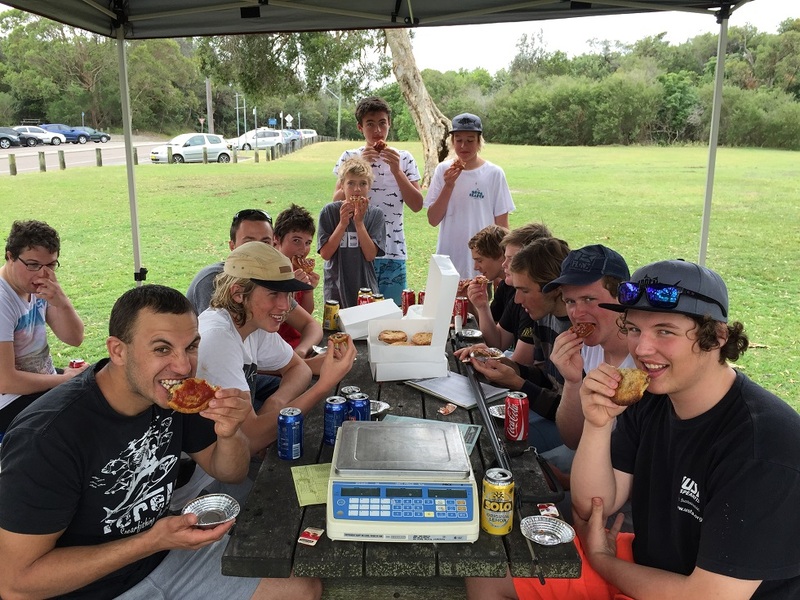 You can find out more about the history of Alec 'Curly' Alliman here. 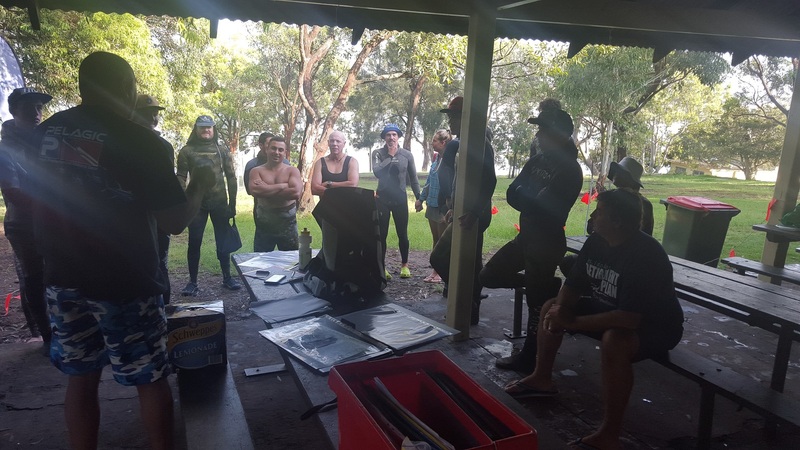 The Taylor shield competition is held every month on the first Sunday. 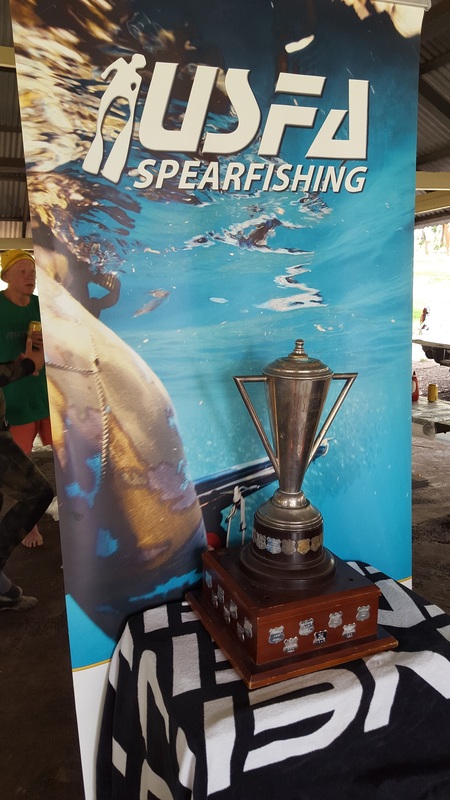 The spearfishing competition dates back to the early 60’s. 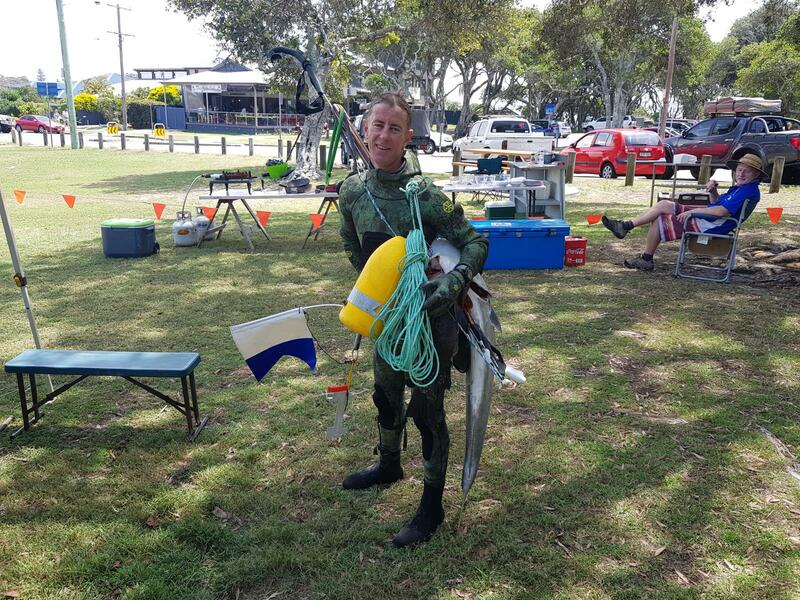 In the height of spearfishing popularity, the early 70’s, there were many clubs on the south coast, all of them being a part of the two zones in the region, the southern zone and the far southern zone. 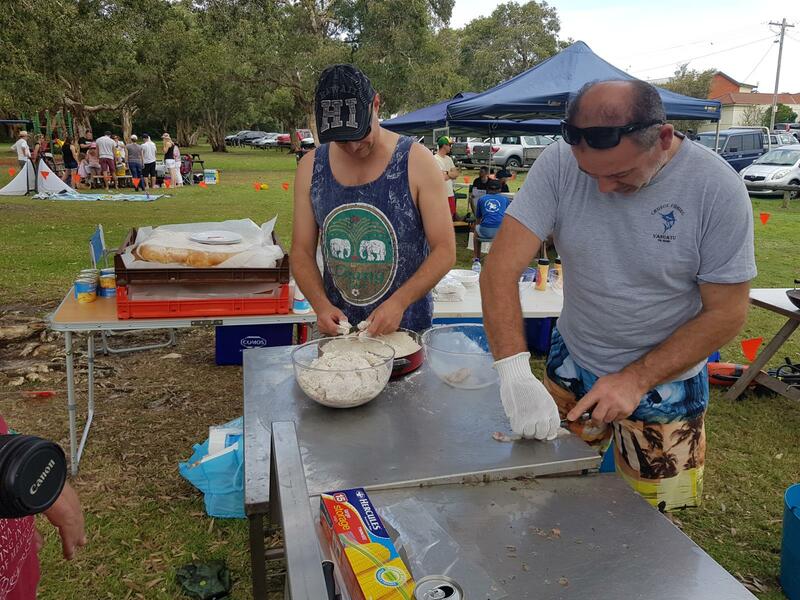 Gradually less competitors were competing so smaller clubs weren’t able to function with so few members, they ended up joining up with bigger clubs such as the South Coast Skindivers Club. 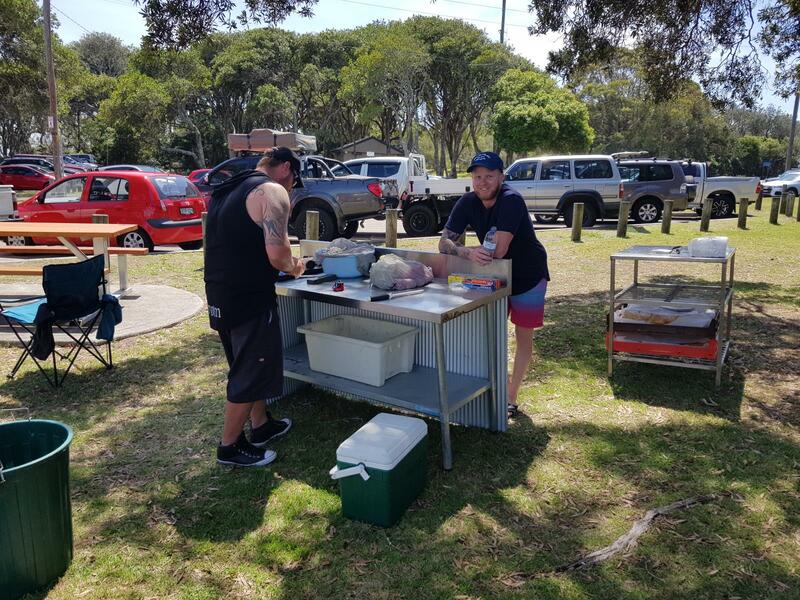 The Taylor Shield is now contested within the Southern Zone, which comprises of the Barracudas, Reversby Workers Club and a southern branch of the San Souci Dolphins. 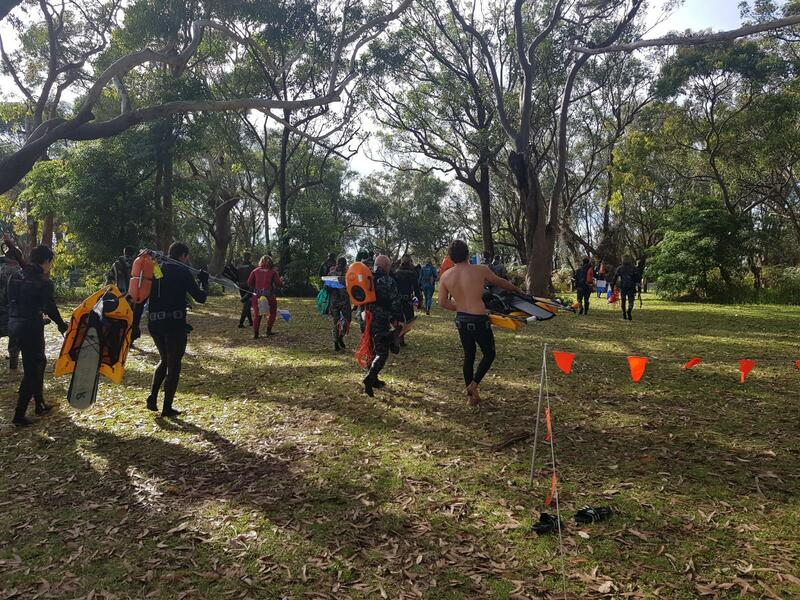 Each competitor dives not only for his individual points but also to contribute to a club score. 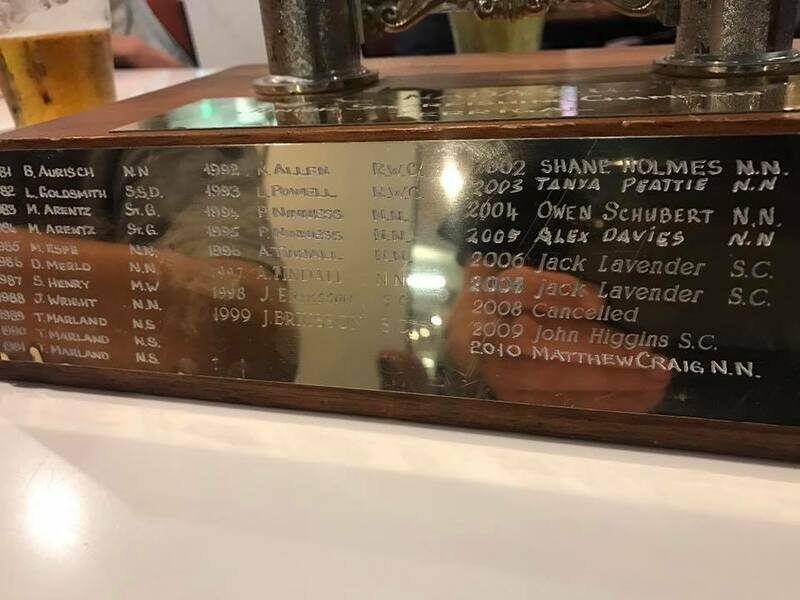 The sum of these points over a competiton year decides the winner of the Taylor shield in that year. 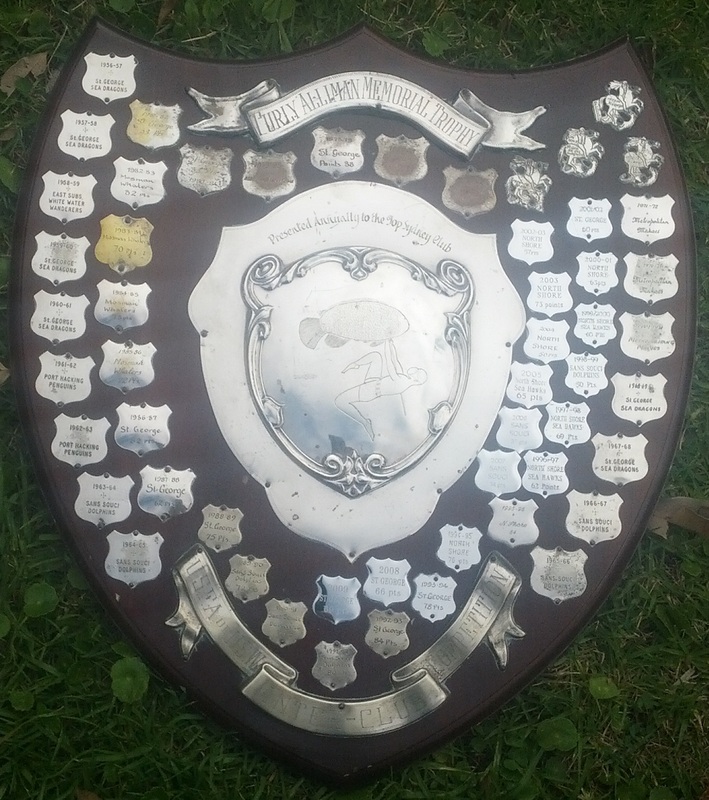 Barra's have won the Taylor Shield 28 times in 44 years, RWC 13 times. 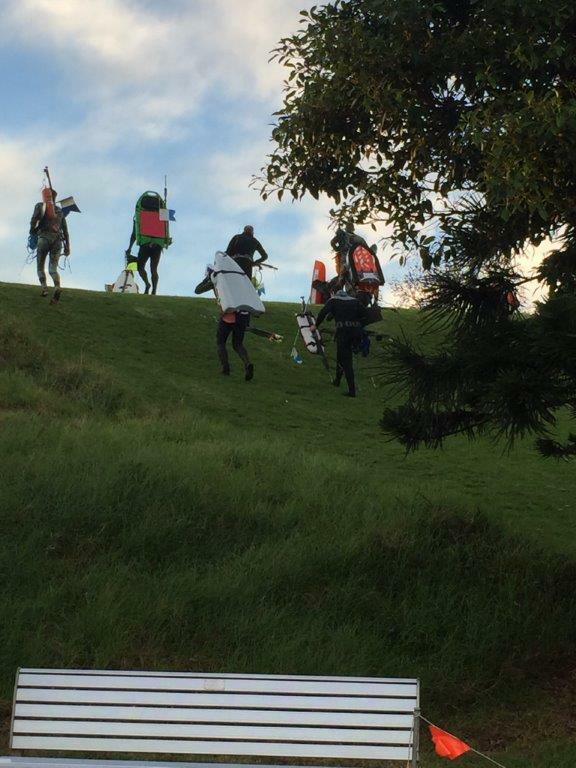 Other clubs won the title the other 3 times. 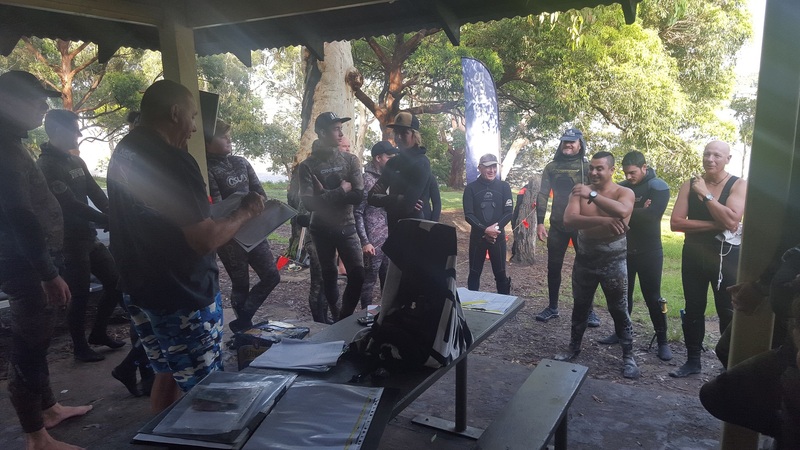 The Living Water Freedivers comp structure has evolved over the past three years, concentrating on selective taking of fish as this is an ecologically sustainable sport. 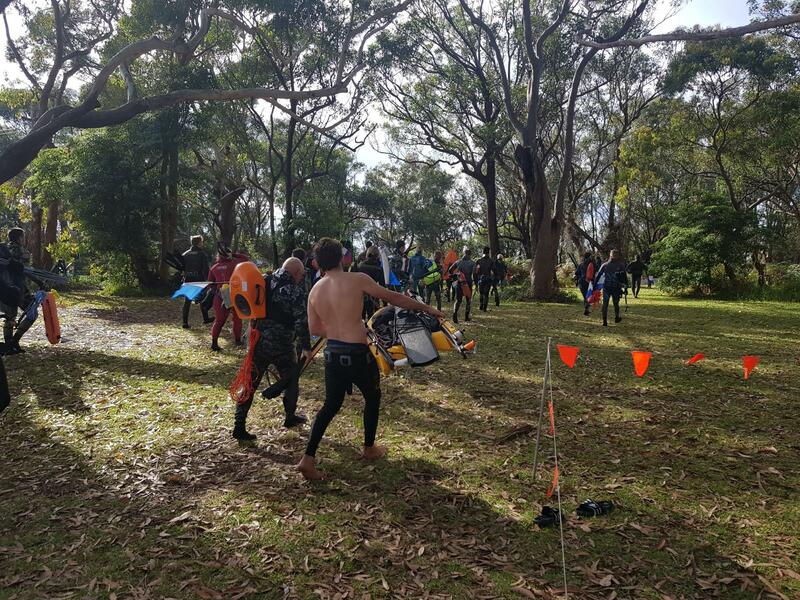 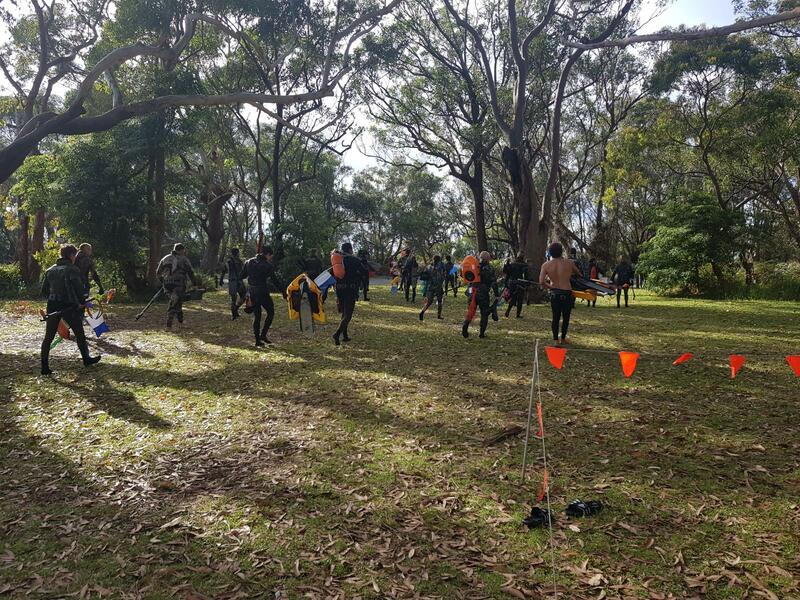 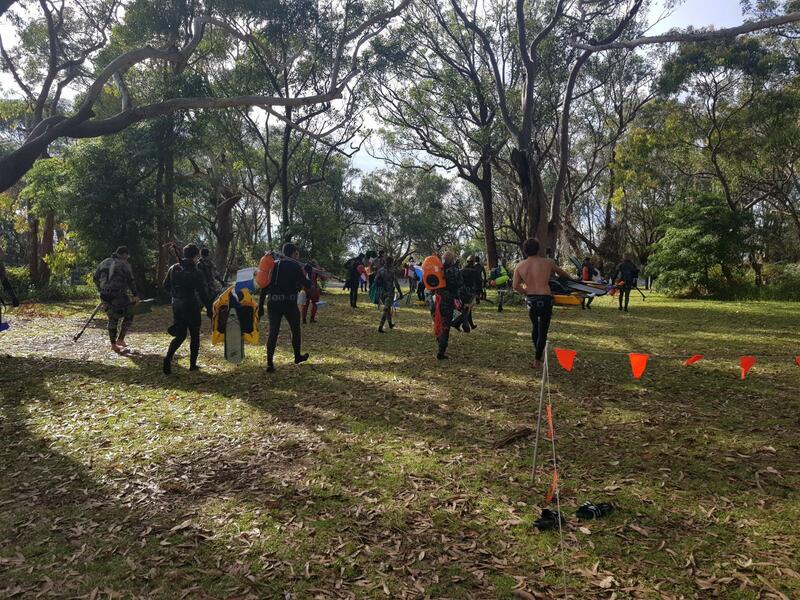 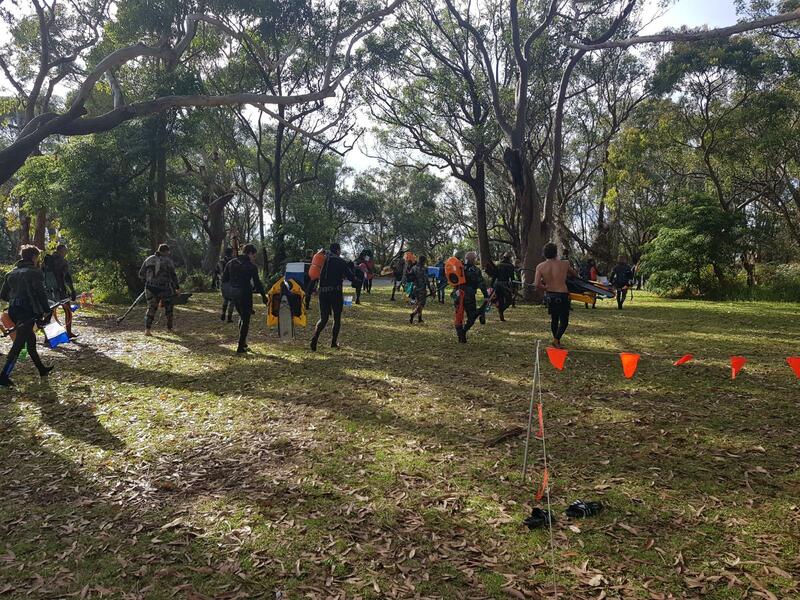 The comp is run by Living Water Freedivers who are proudly affiliated with the NSW Underwater Skindivers & Fishermans Association. 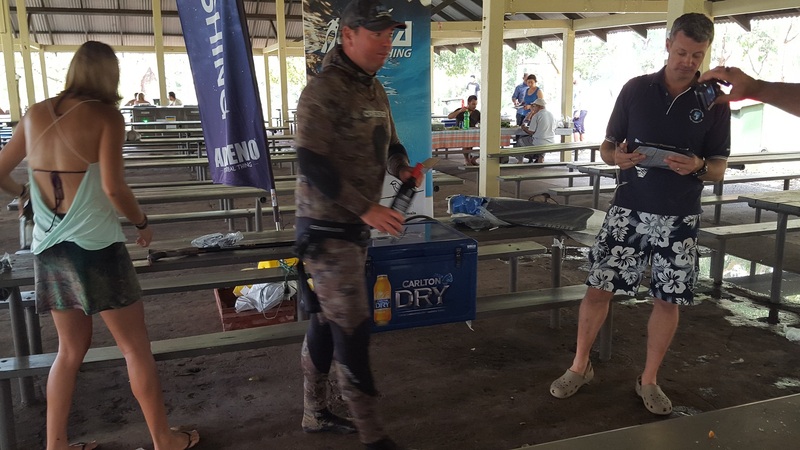 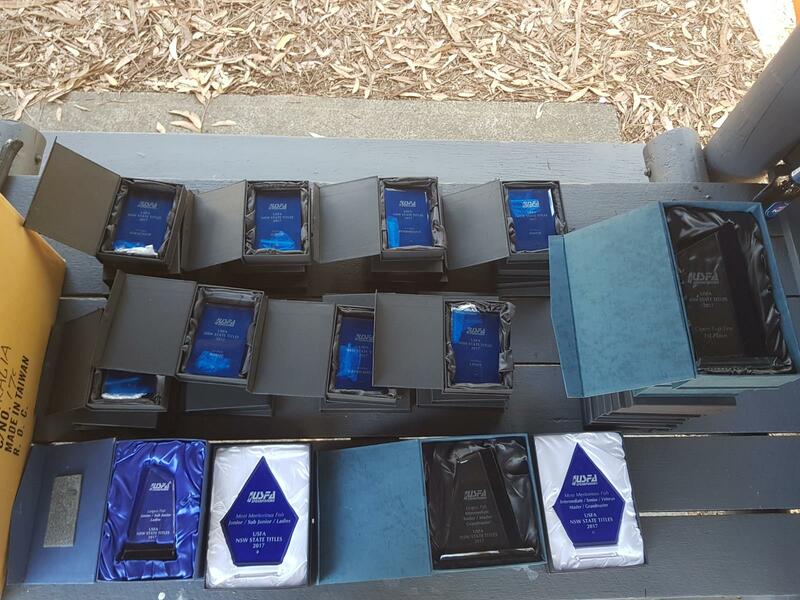 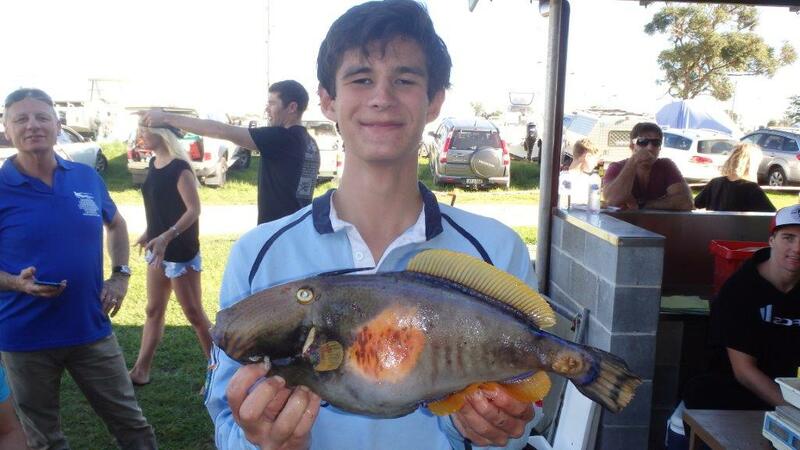 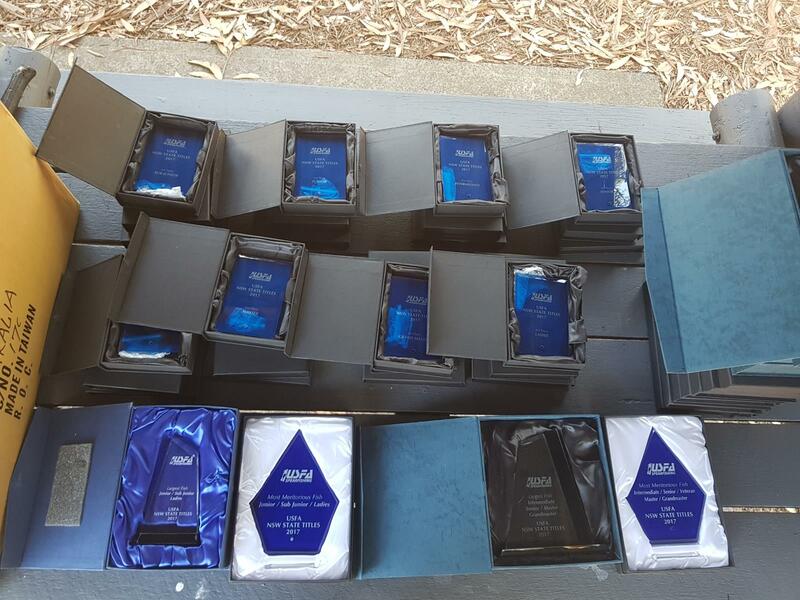 The competition is open to all spearos affiliated with the USFA which encourages selective fishing by awarding the top ten biggest fish, from a selective species list, weighed in for the day. 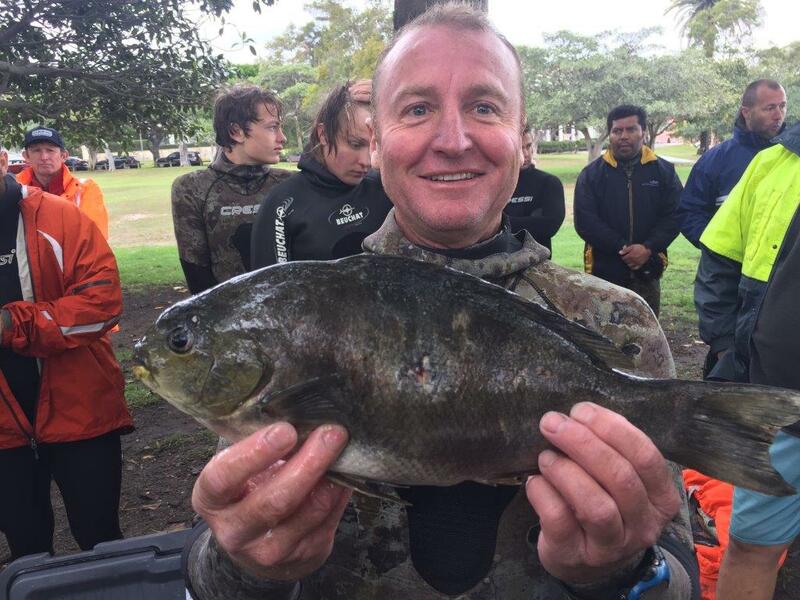 Competitors can only weigh one fish in this competition making it a comp that allows the diver to target a particular species rather than several. 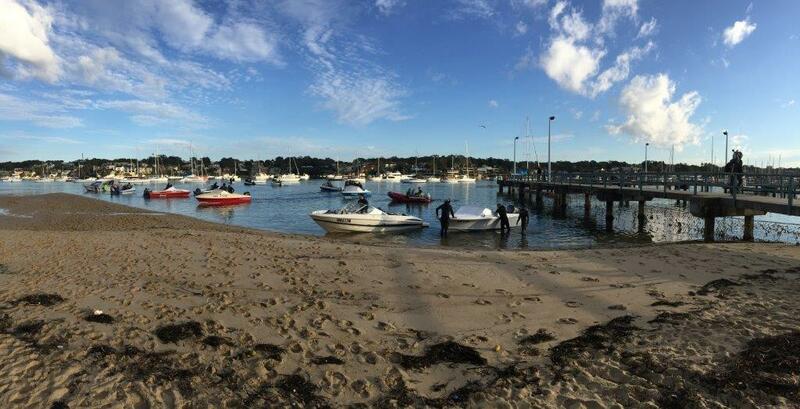 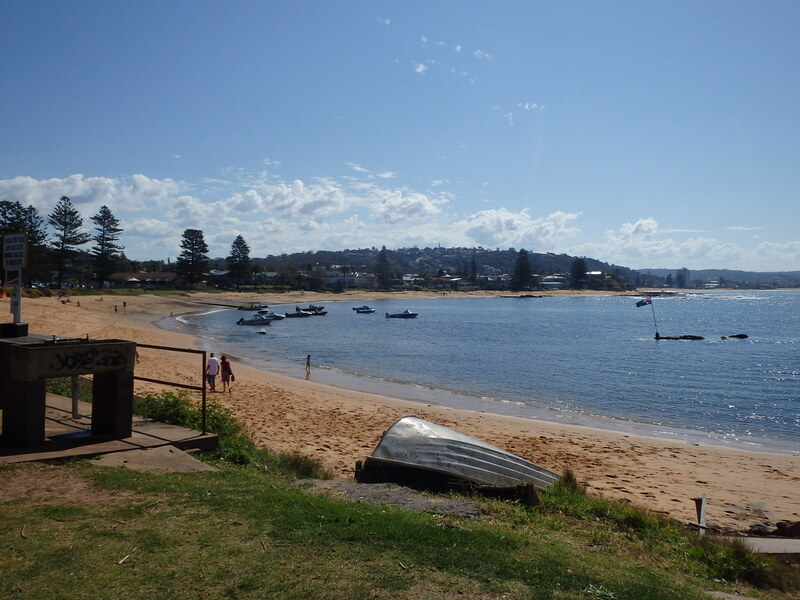 Nelson Bay is located a comfortable 3 hour drive north of Sydney in NSW. 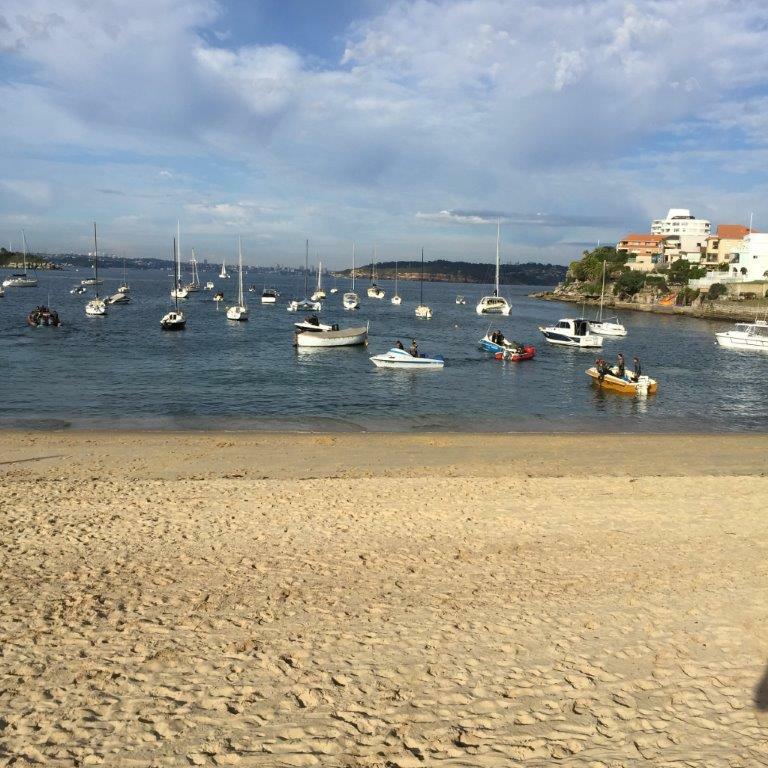 Its well known as a popular tourist destination that offers great accommodation, restaurants, spectacular views and beaches. 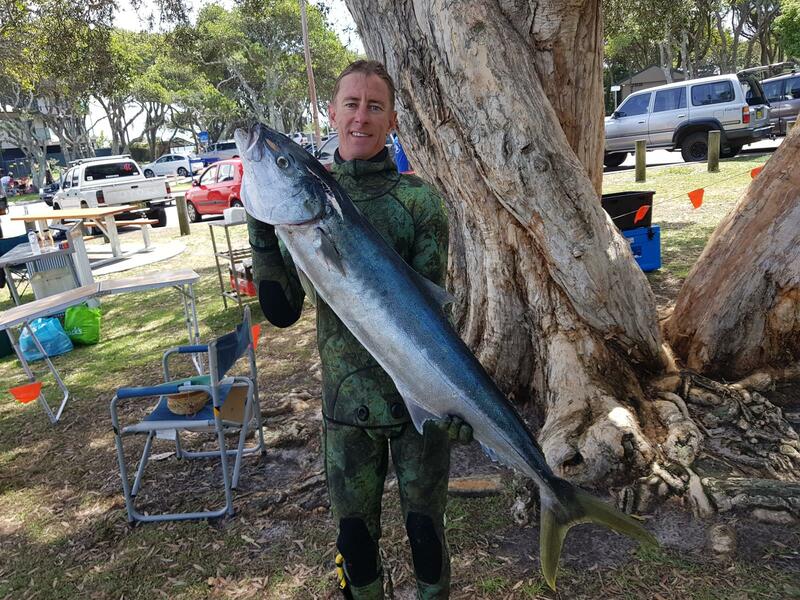 Another exceptional quality is the areas well-known ability to produce large game fish and other species in the clear warm waters from January to June each year as the East Australian Current pushes warmer water down from more subtropical areas up north. 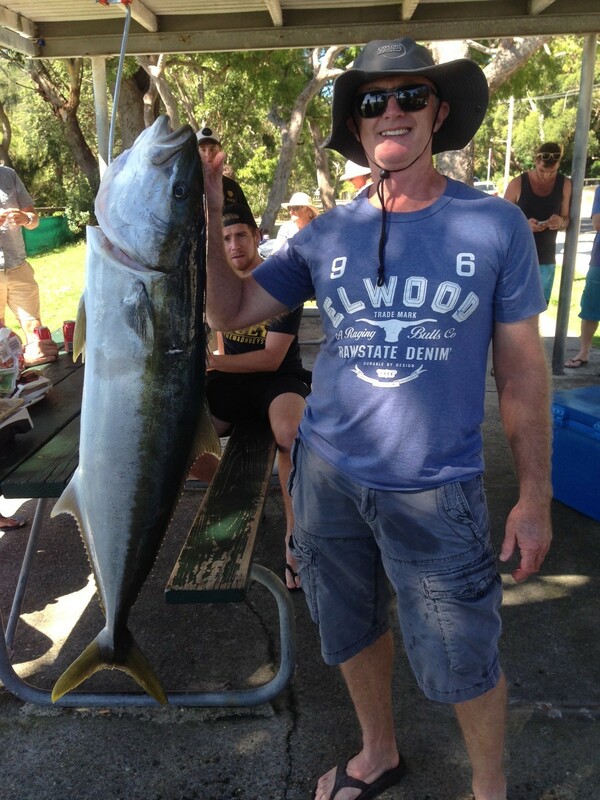 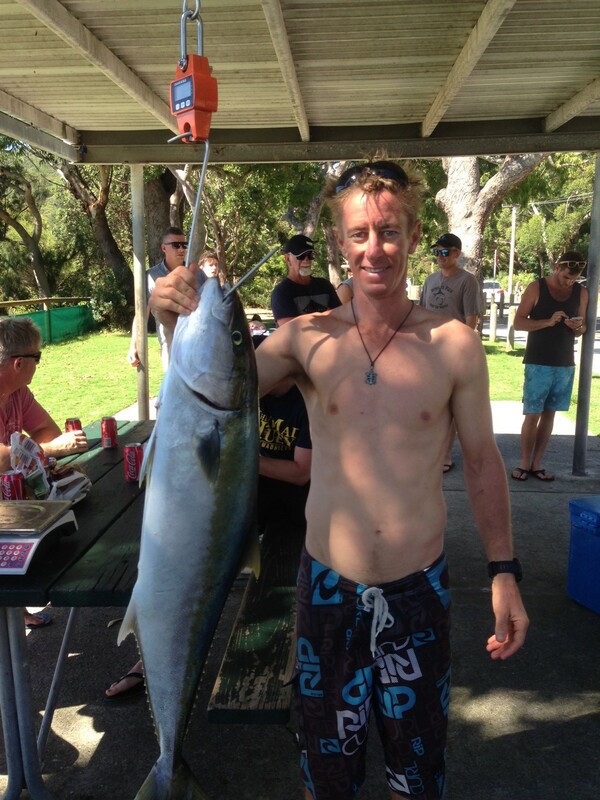 The warmer current brings with it marlin, dolphin fish, yellow tail kingfish, mulloway and cobia, just to list a few. 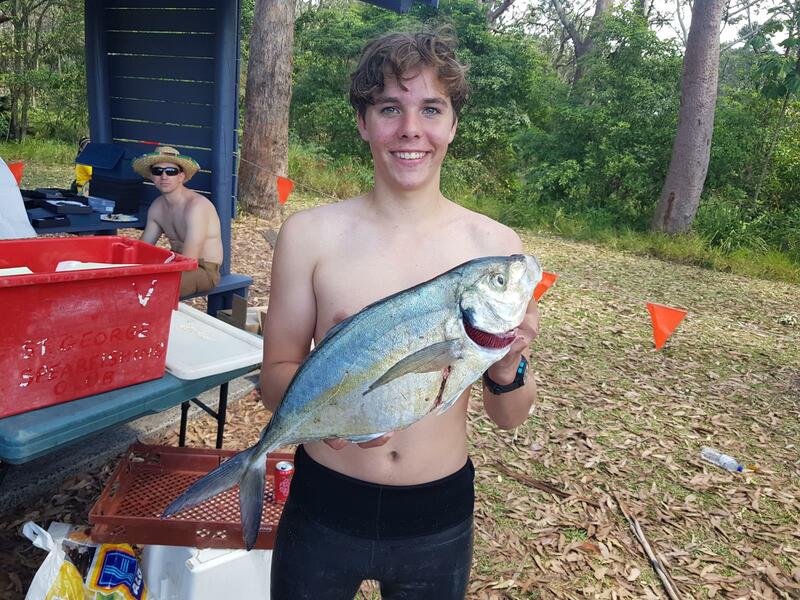 The coast has a number of offshore islands and reef systems that hold excellent reef fish and pelagic fish, a small tinny can easily access these, so to enjoy the fishing does not mean big dollars. 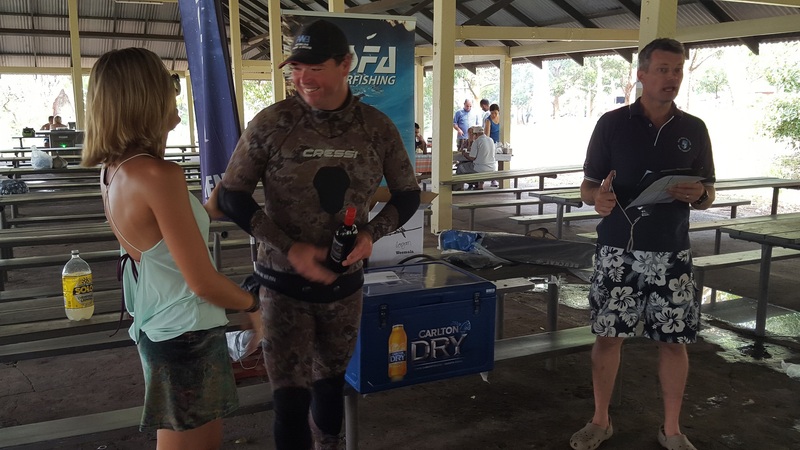 The Spearfishing Challenge was designed to limit each competitor to one fish at weigh in. 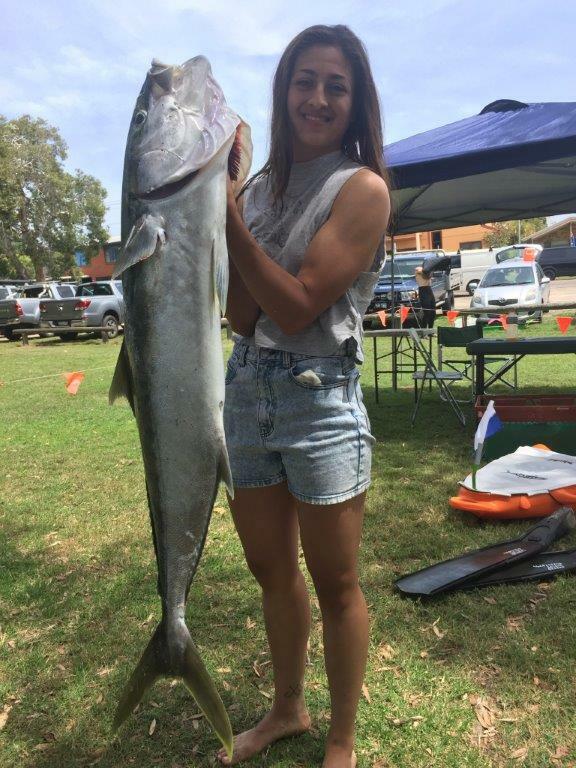 By doing so we limit the overall catch of competitors and normally the weigh in is much more spectacular due to people hunting for larger fish. 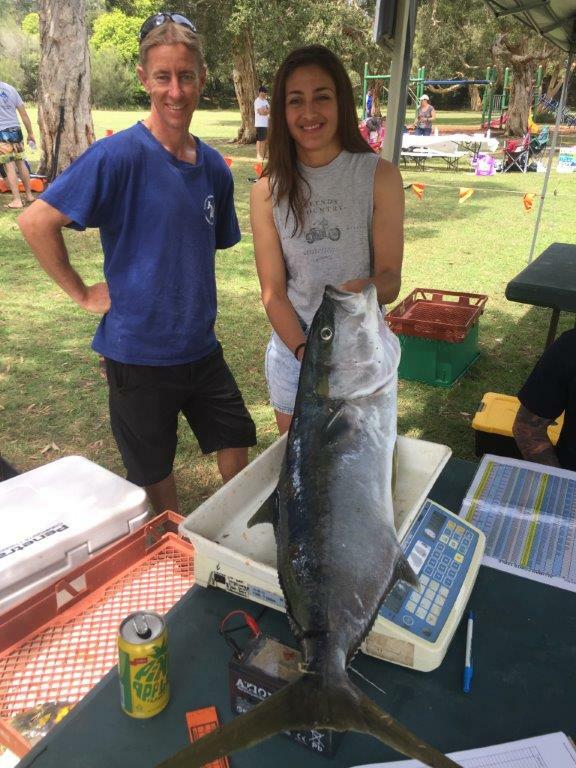 It also decreases the amount of time it takes to conduct the weigh in, leaving more time for the important things eg. 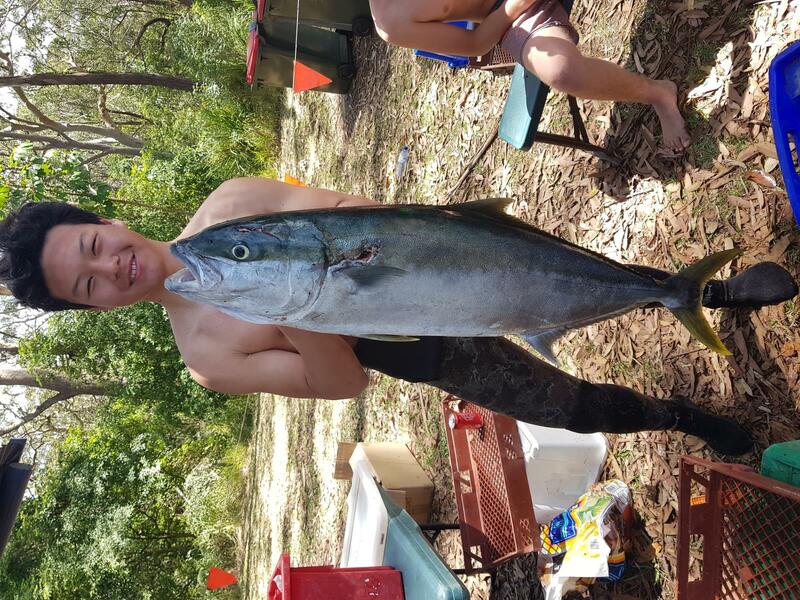 talking about the one that got away! 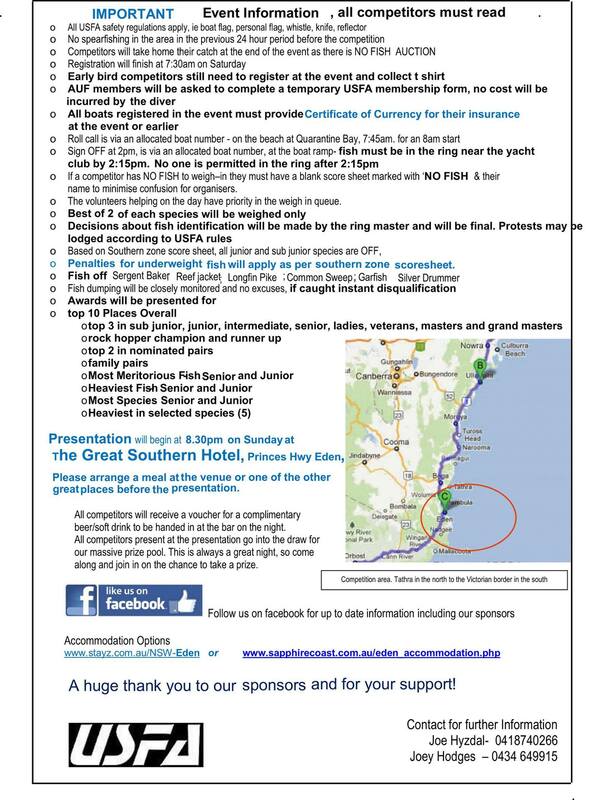 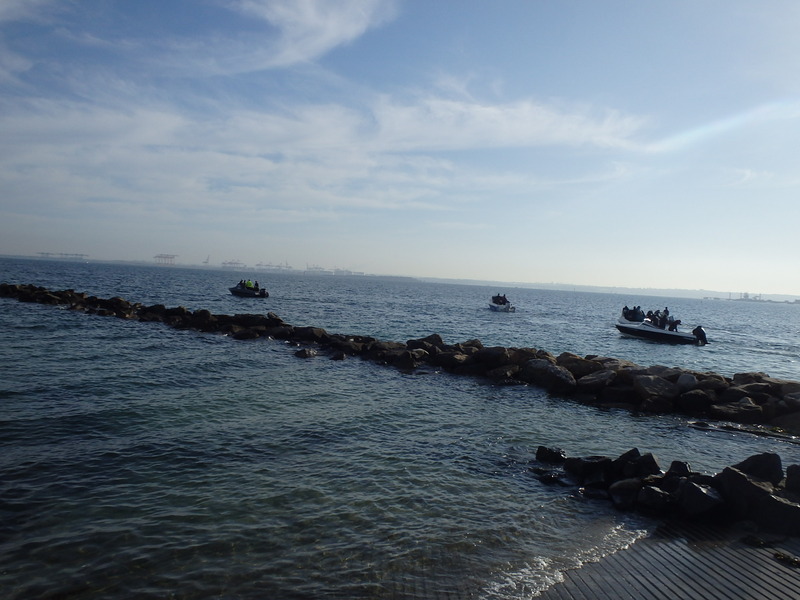 The format for the comp is one fish per diver to be weighed in, a Species List will be made available on the day for all divers to have, this is not a pelagic only comp. 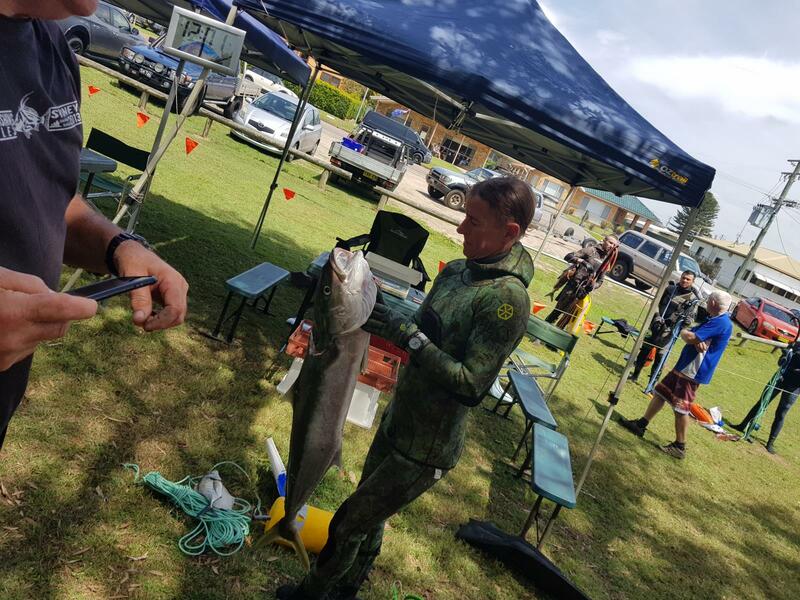 For the last six years in late June early July a large group of mostly like-minded spearfishermen and women have gathered in the small coastal town of 1770 in Central Queensland for the 1770 Classic. 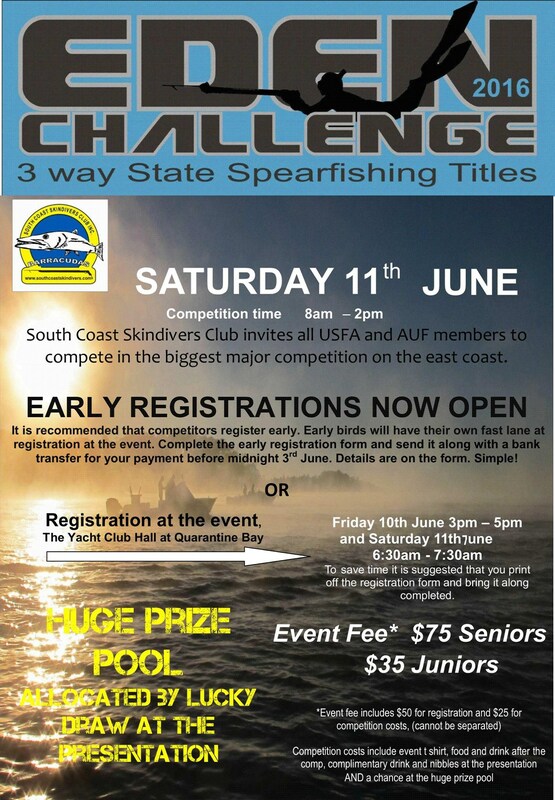 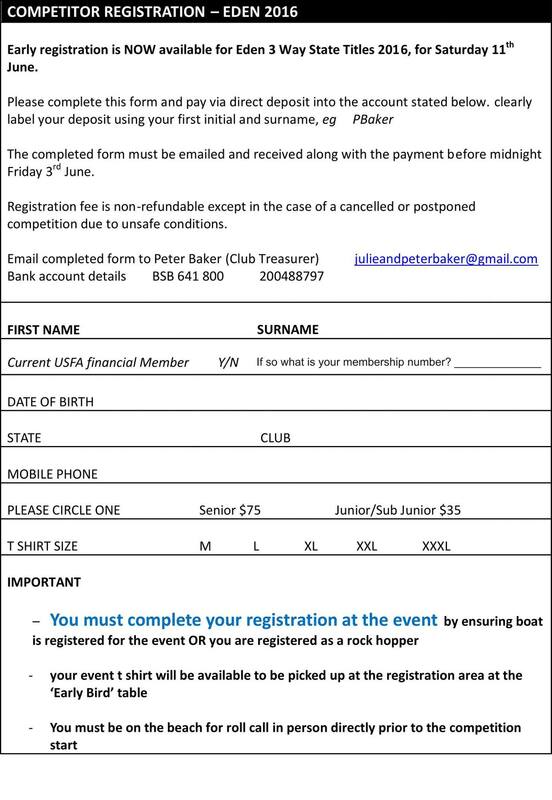 The Classic was started back in 2009 by the Organising committee of the Curtis coast Spearfishing Club. 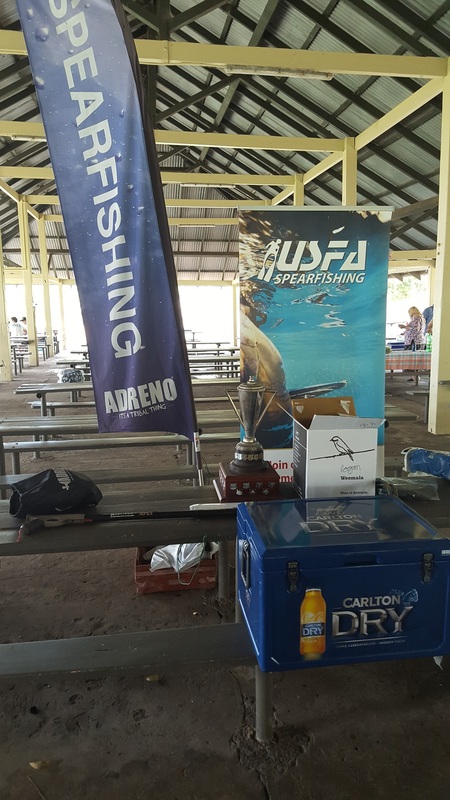 For the first two years it was held as an in house competition, but in 2011 the competition was opened up to all A.U.F. 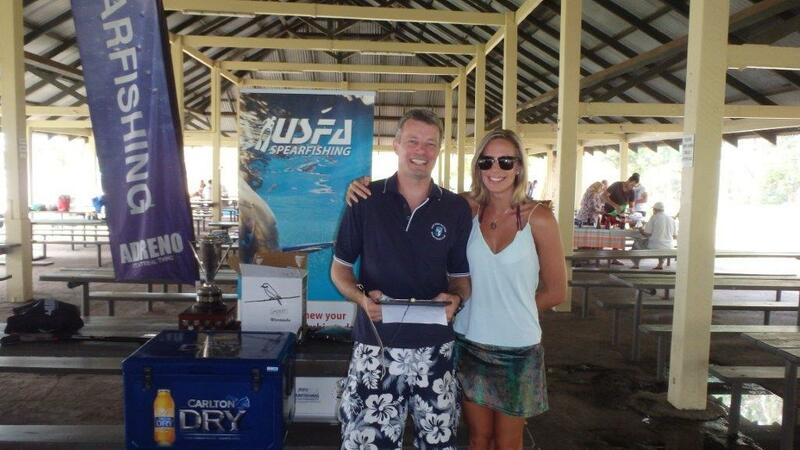 registered divers with an overwhelming response of 43 competitors. 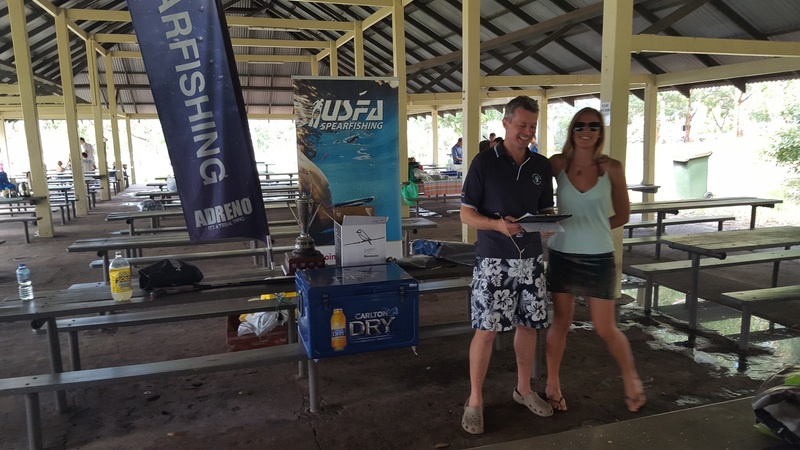 Since then the competition has grown each year and this year’s competition has already attracted interest from around 70 divers. 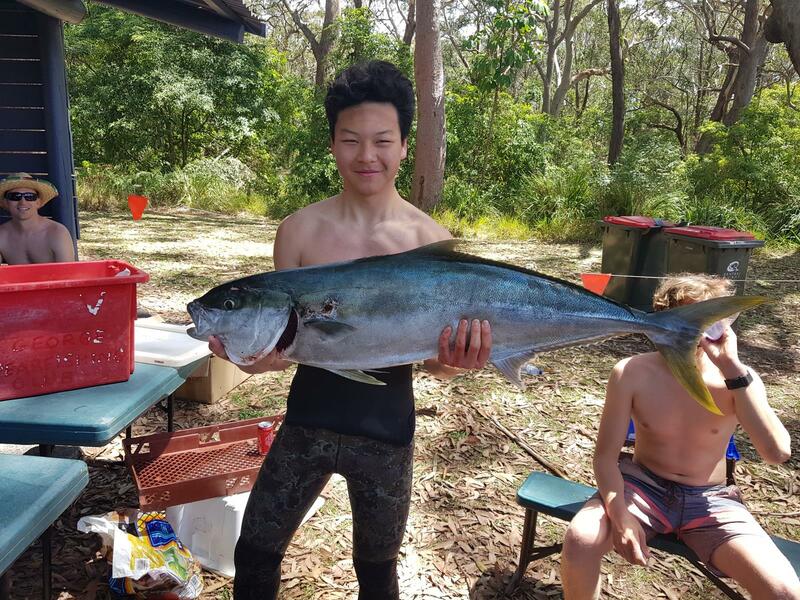 The location for the Classic (1770) is one of the most picturesque, laid back coastal town you are likely to find anywhere on the Queensland coast, with impressive headlands and sheltered bays 1770 is a must see destination for both Aussies and overseas travellers alike. 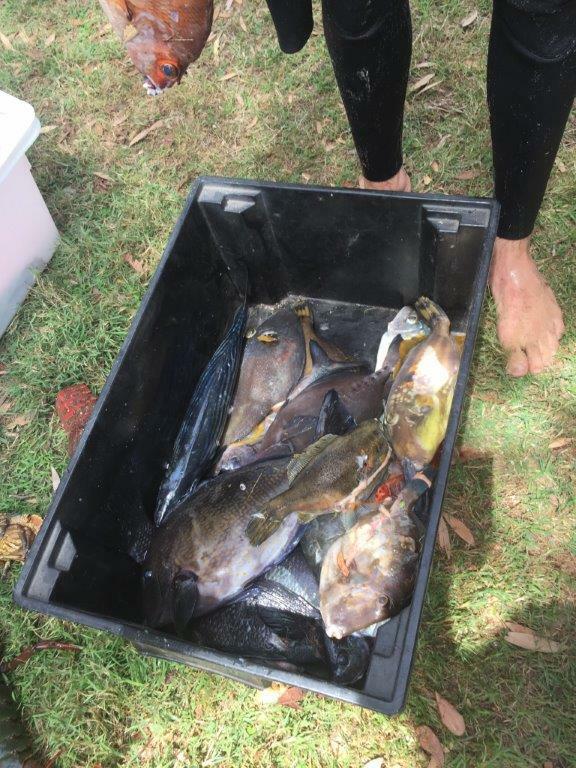 Also 1770 is in very close proximity to the southern end of the Great Barrier Reef (1 hour by boat) and has access to a vast network of coastal inlets and reefs. 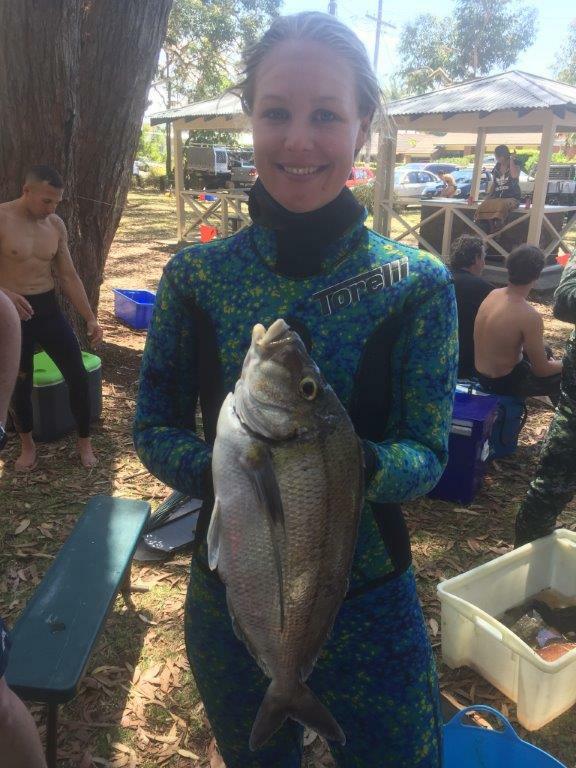 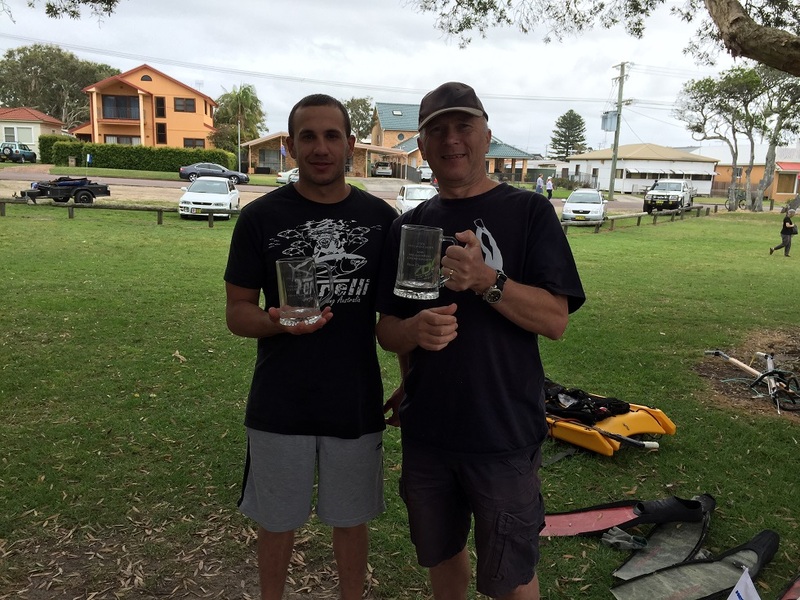 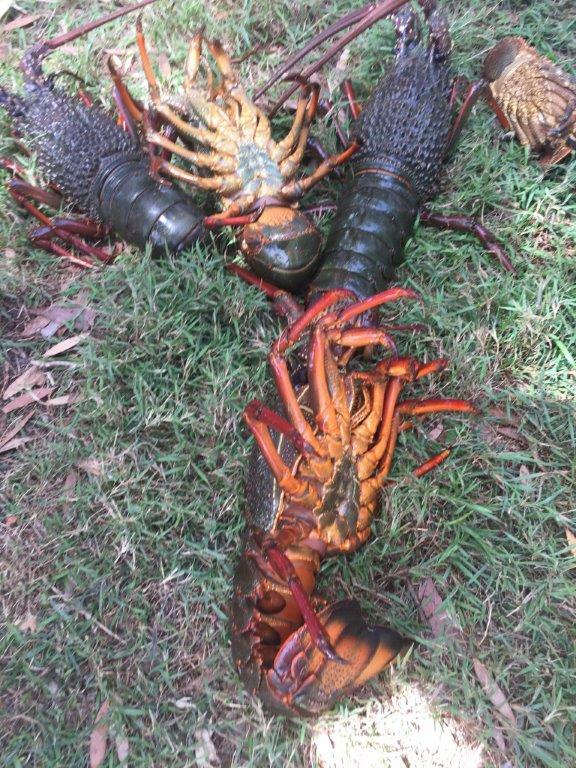 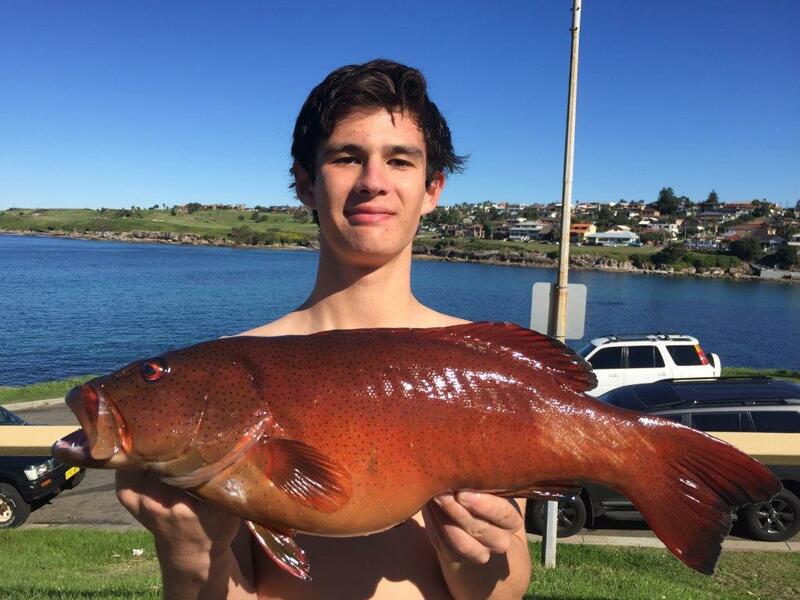 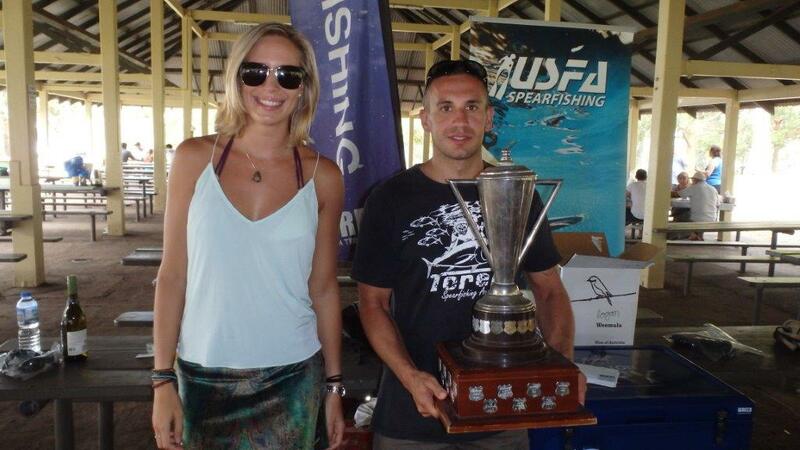 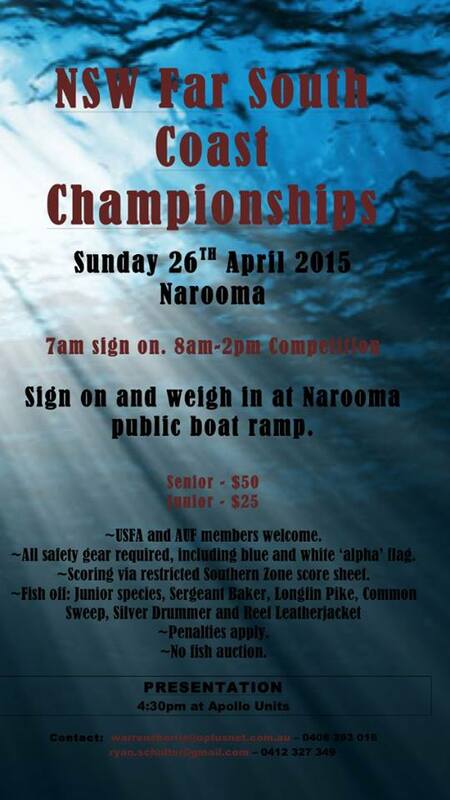 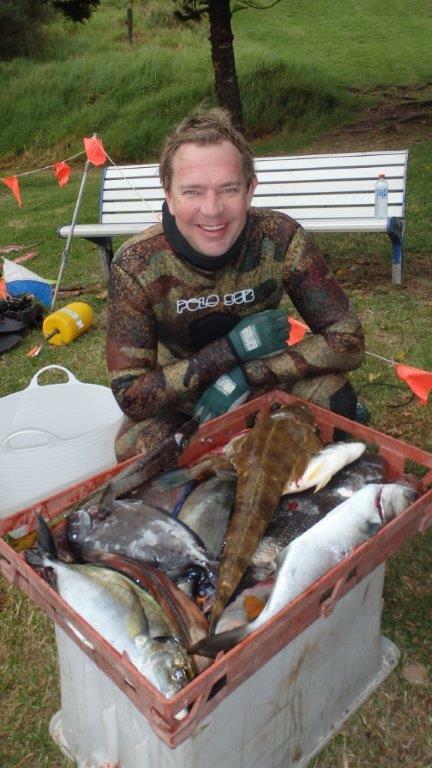 The Competition for the 1770 Classic is not unique however it is a different scoring system to most of the other spearfishing competitions around Australia. 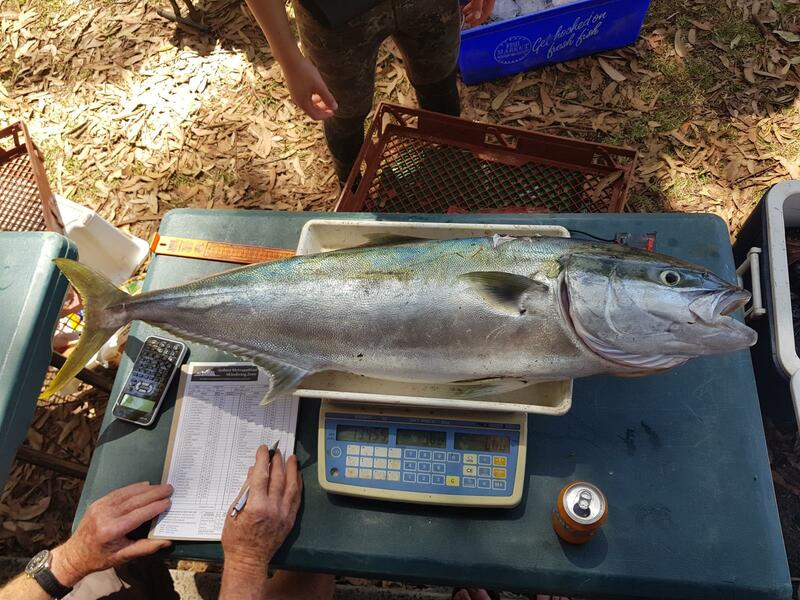 The system simply sets a species list and a target weight for each species. 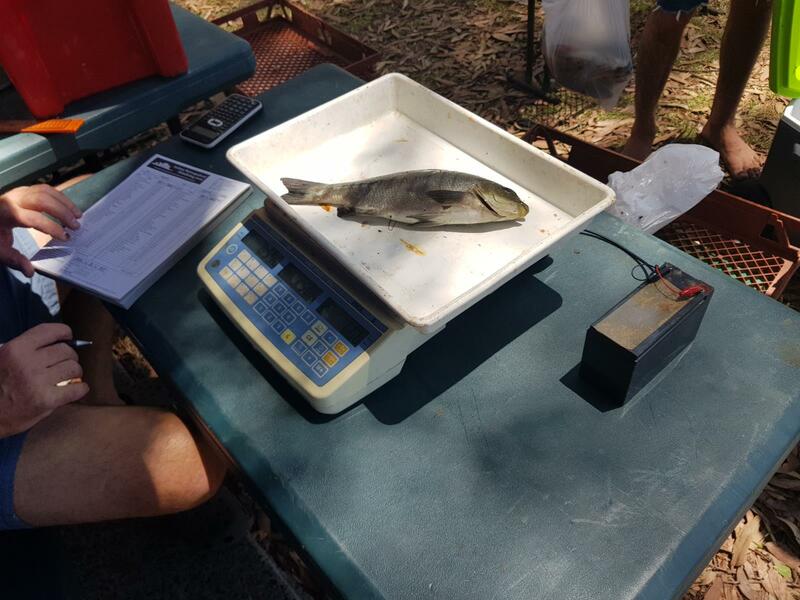 Divers are allowed to weigh in three fish each (from the species list) and points are awarded as a percentage of the target weight.